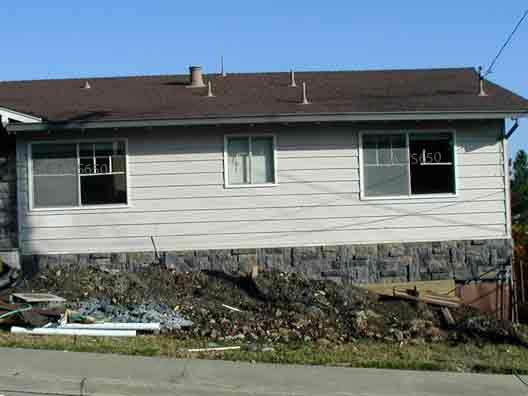 Welcome to our Before and After photo gallery of some of the homes I had before pictures of. This is just a sample of the work I have done since 1989. INSTRUCTIONS: Many Photos have another photo behind them and wording will inform you of that. IPAD and IPHONE: Touch image to see background image. Touch any other image to go back to top image. 26 foot Andersen window wall in San Carlos. 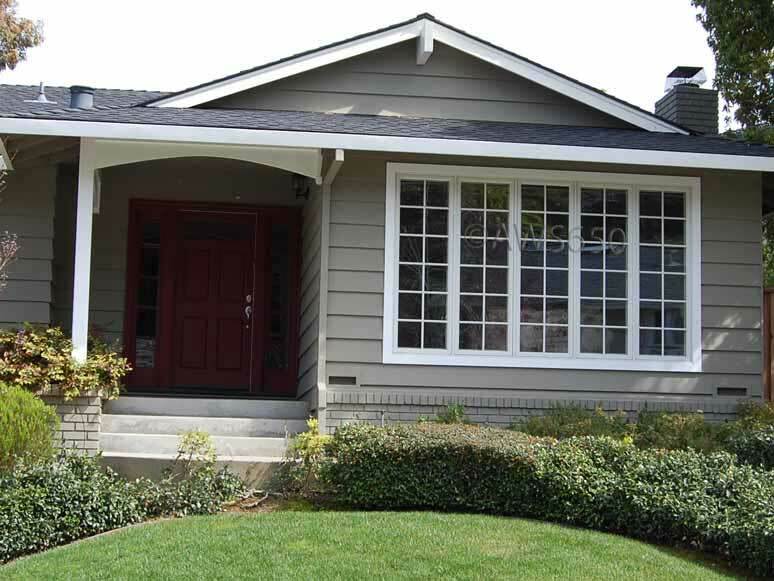 The door at the end of the window is a Andersen 400 series French wood hinged door. 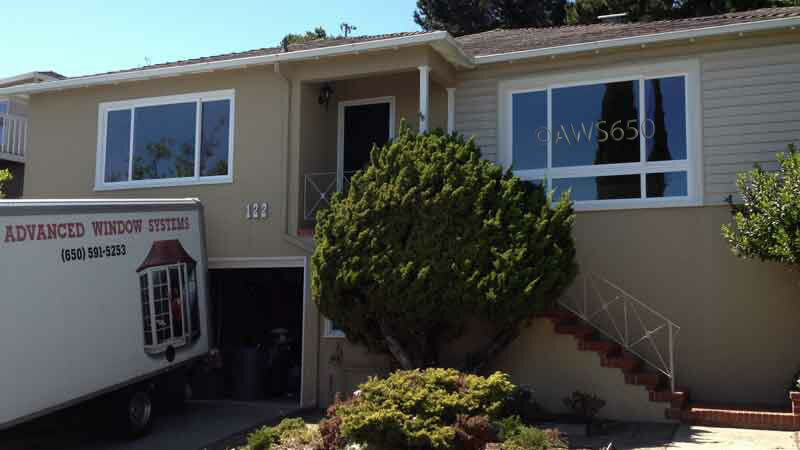 All the windows and doors on this job had 2" wood stucco molding installed around the exterior perimeter. Three feet of this window is not in this photo. 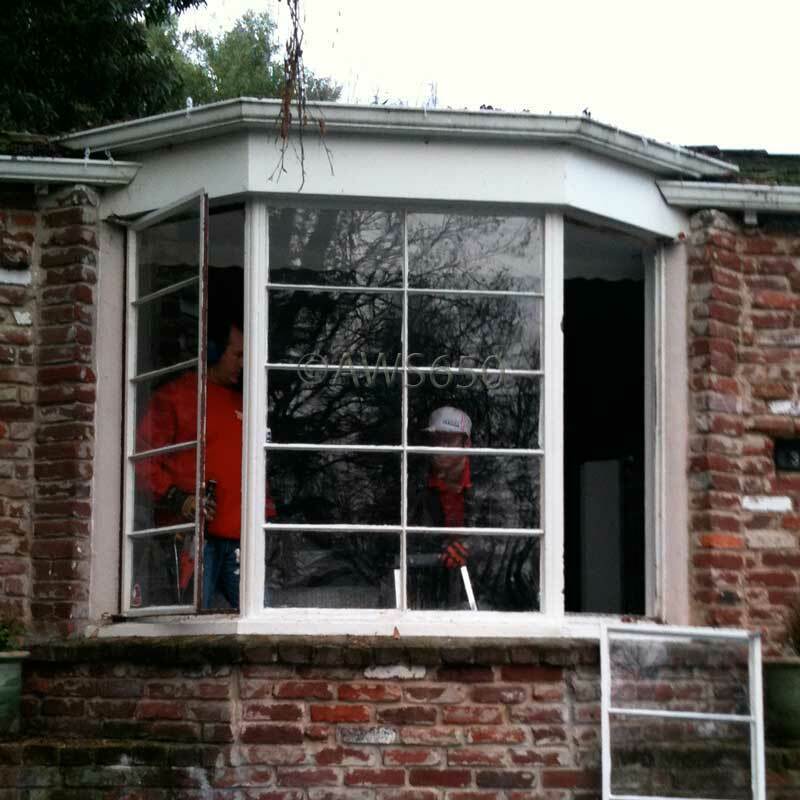 Before of 26' steel window that had Bull Nose stucco. 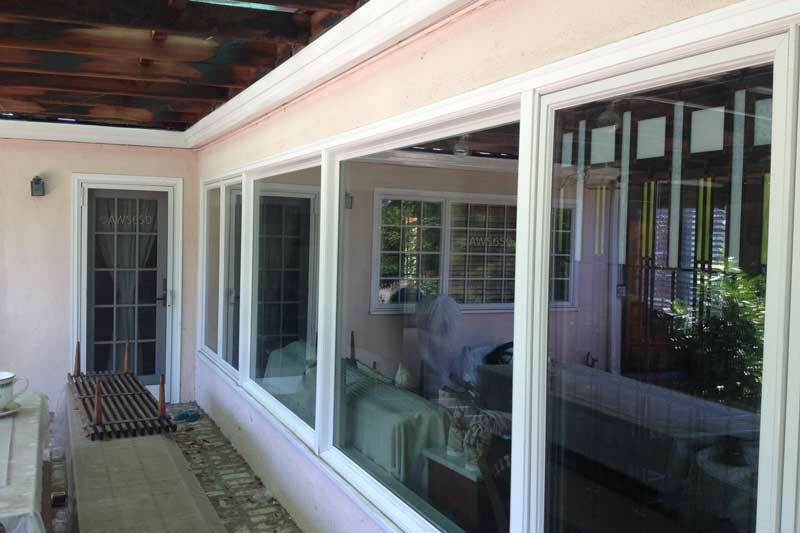 Some of the framing had termite damage that we repaired. Before photo of half the 26' steel window wall. 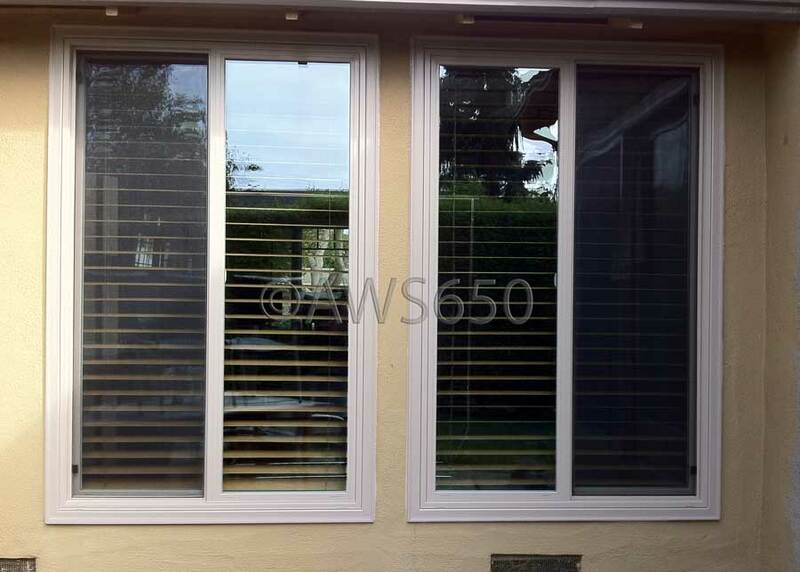 Andersen 400 series Casement windows with S.D.L. 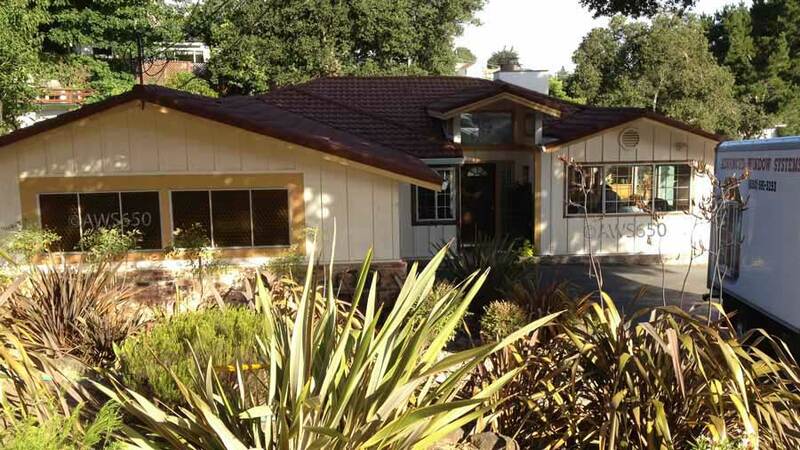 grids installed in the kitchen of this San Carlos home. Before All but one of the original steel windows removed. 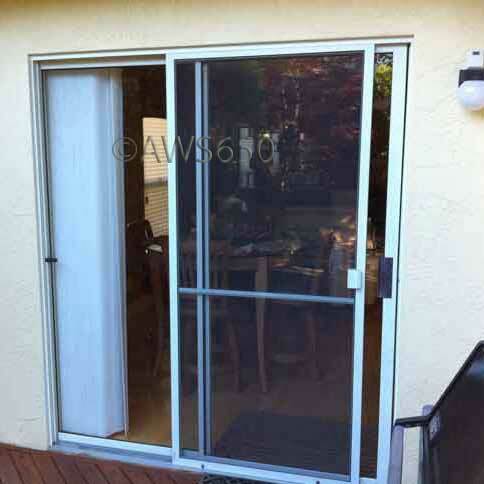 Milgard Tuscany Vinyl Patio door installed over stucco with a Z-Bar Frame in Redwood City,Ca. 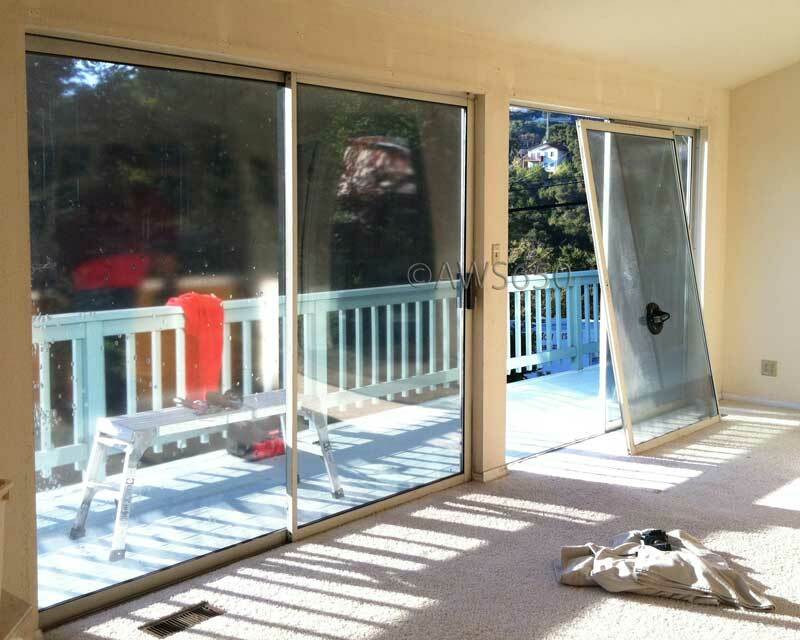 before photo of the aluminum single glazed patio doors. 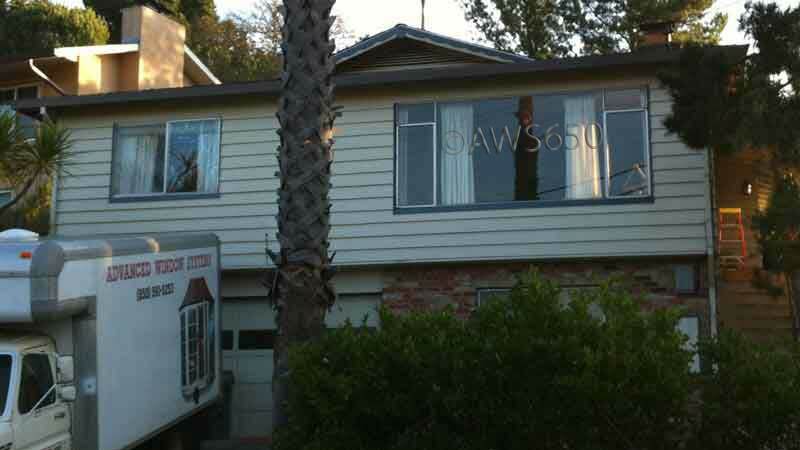 Andersen 400 series Double Hung windows installed in San Carlos. Simulated Divided Lite Grids. 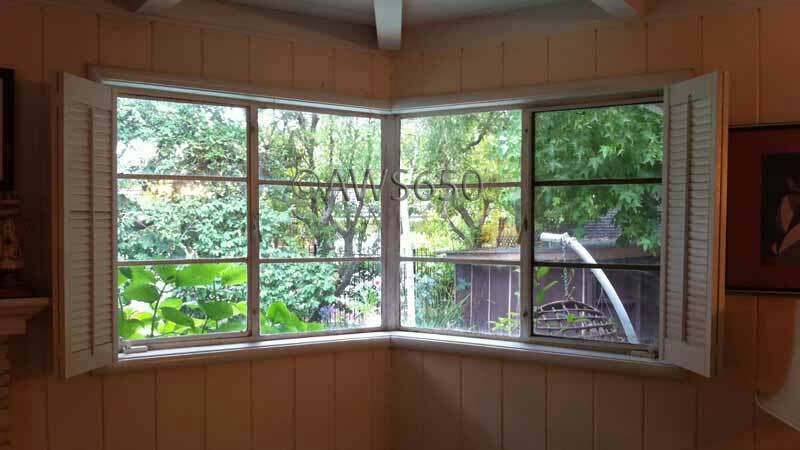 Before photo of the original Aluminum single glazed windows. 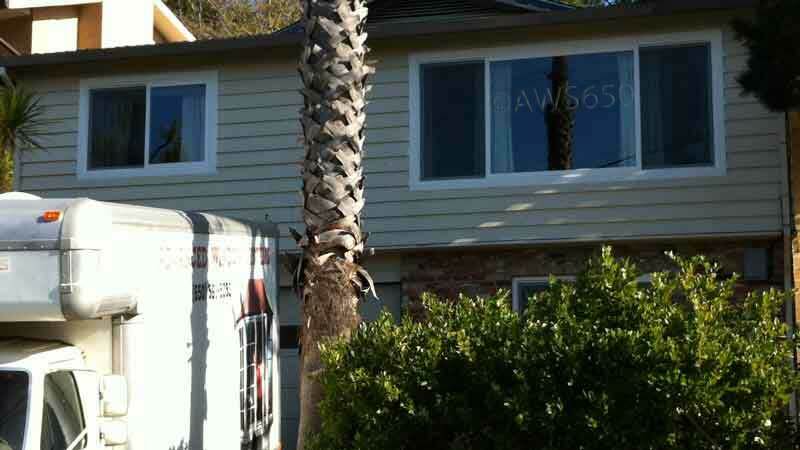 Andersen Double Hung new construction window installation in San Carlos. 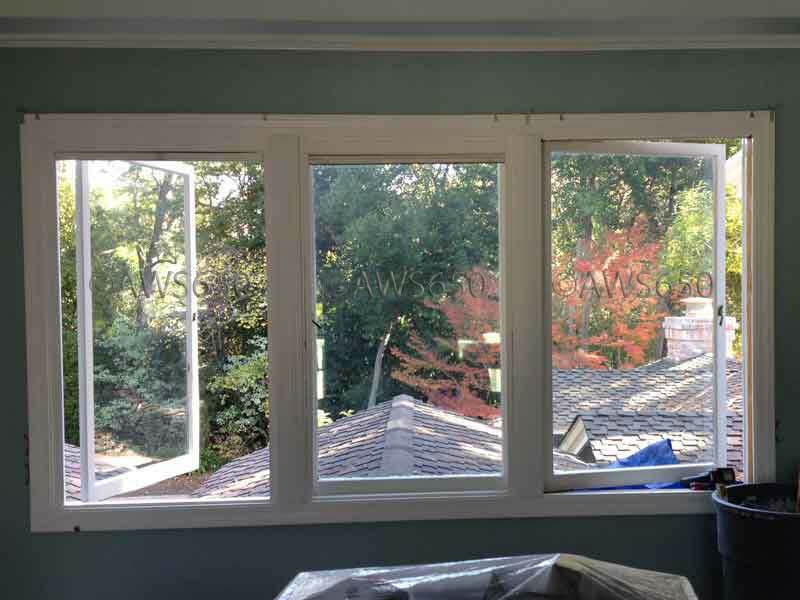 Sills were lowered on both bedroom windows for aesthetics and to conform with the egress code in San Carlos. 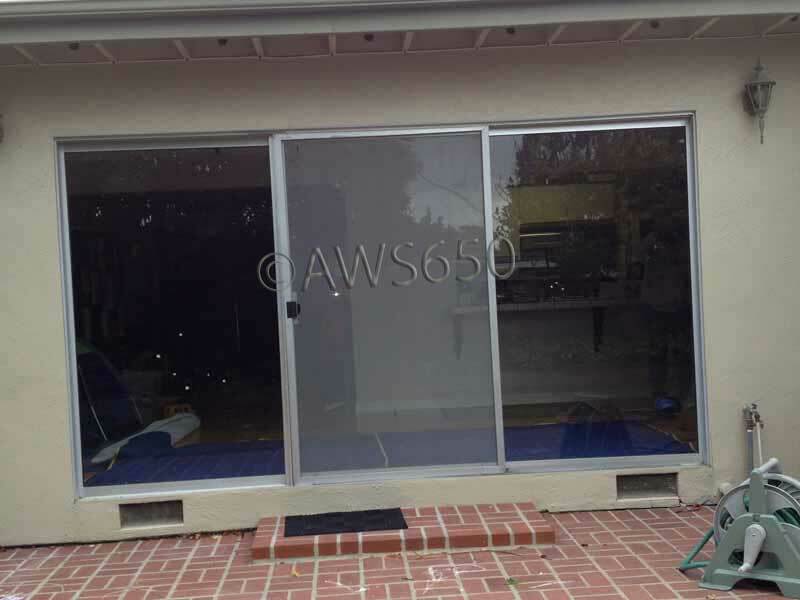 Before Picture of aluminum 8'Patio door. 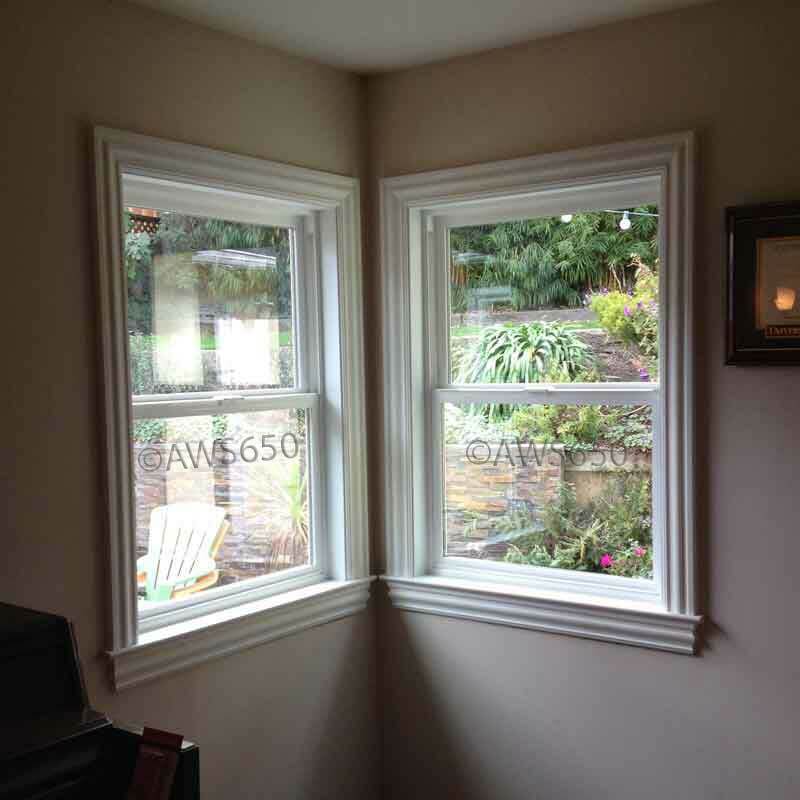 Andersen 400 Series Casement window in living-room with Simulated Divided Lites (S.D.L.) This installation is in San Carlos. 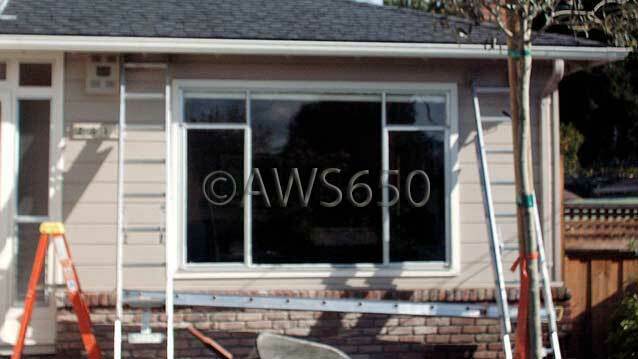 Before photo of Aluminum single glazed casement window. This window is 10 feet wide and 6 feet tall. Before of original aluminum windows with 2 x 3 trim inset into stucco. 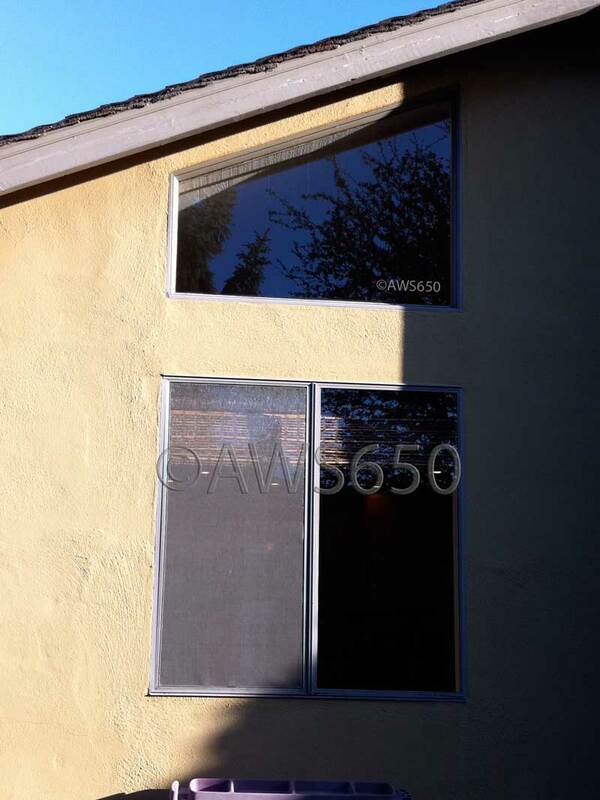 The photo behind the top photo is with the new window installed and the top patch of stucco removed. 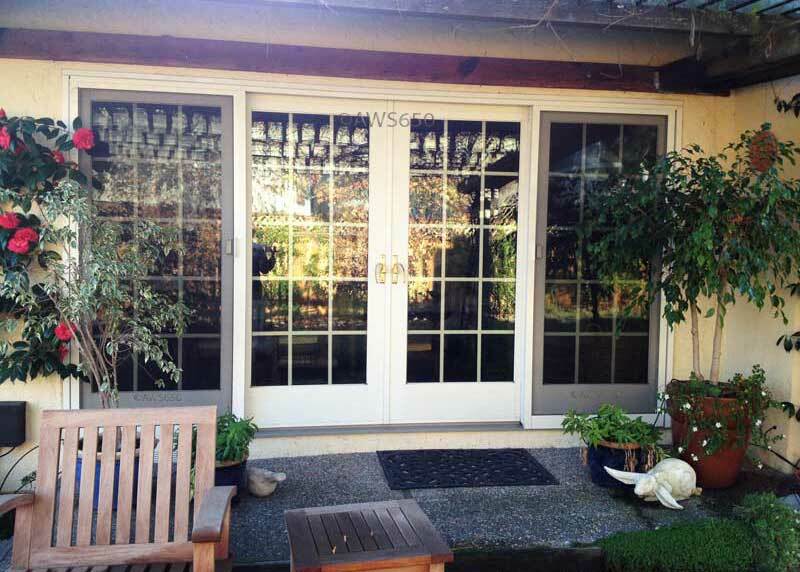 Milgard Tuscany French Rail Vinyl Patio door installed over stucco with a Z-Bar Frame. 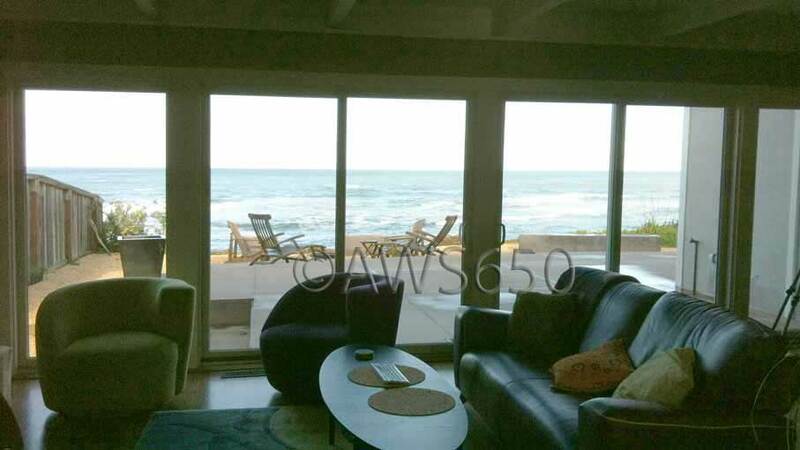 This installation was done in Half Moon Bay. 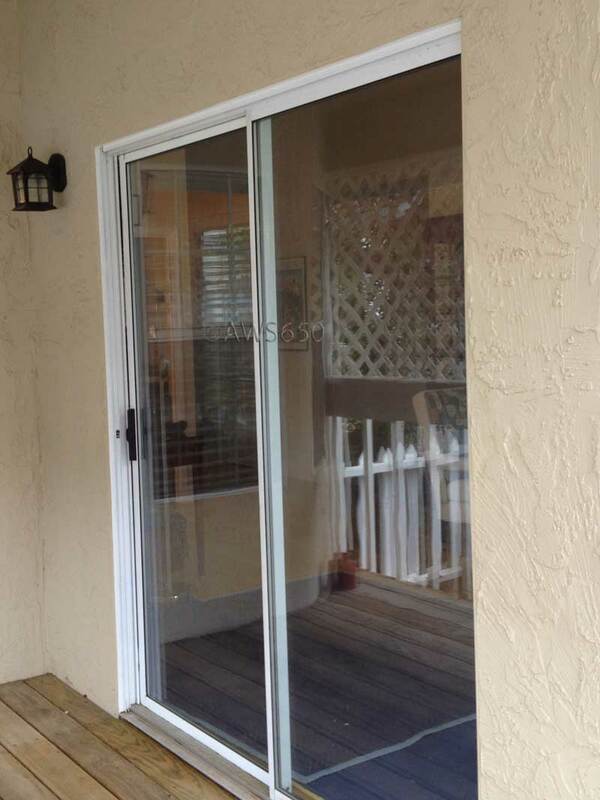 Before picture of the Aluminum single glazed patio door. The original perimeter frame was left in tact as part of the installation. 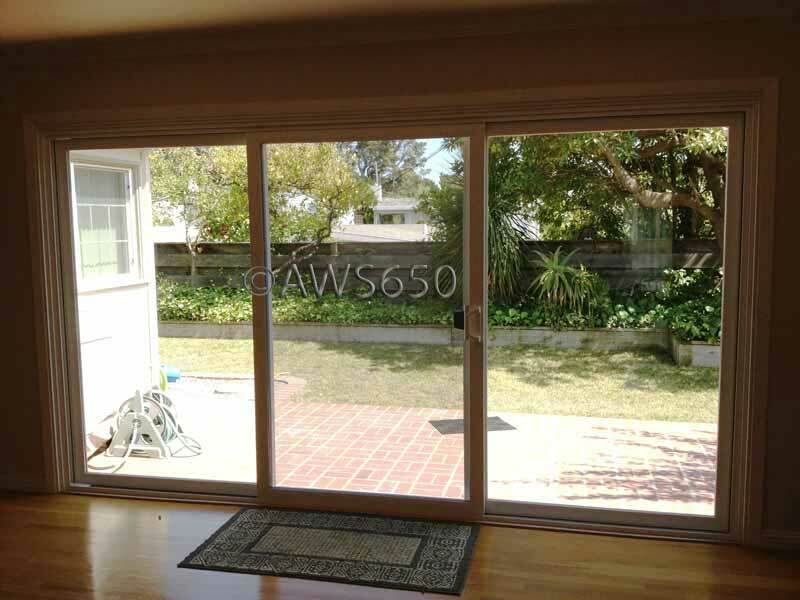 This is a 6 foot Patio Door. 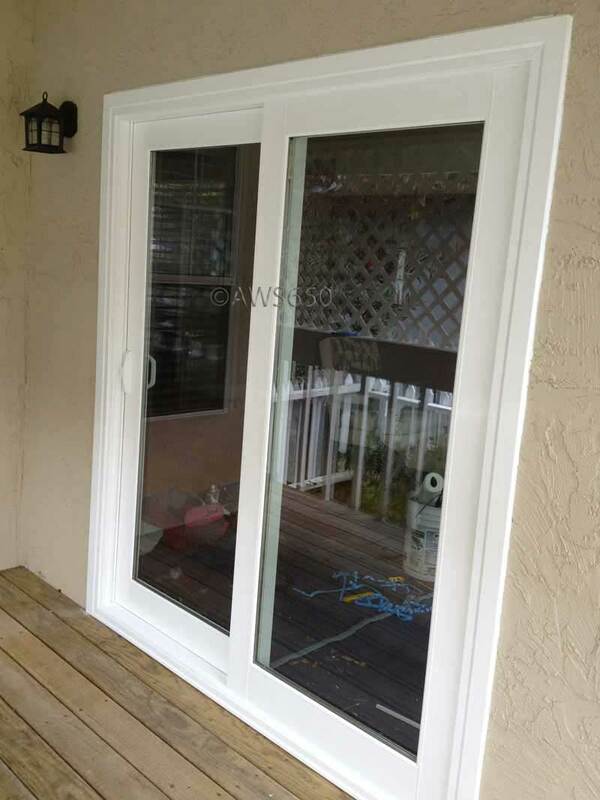 Andersen 30 degree 400 series Casement Bay. Installed in Belmont,Ca. Size is 96 x 60. 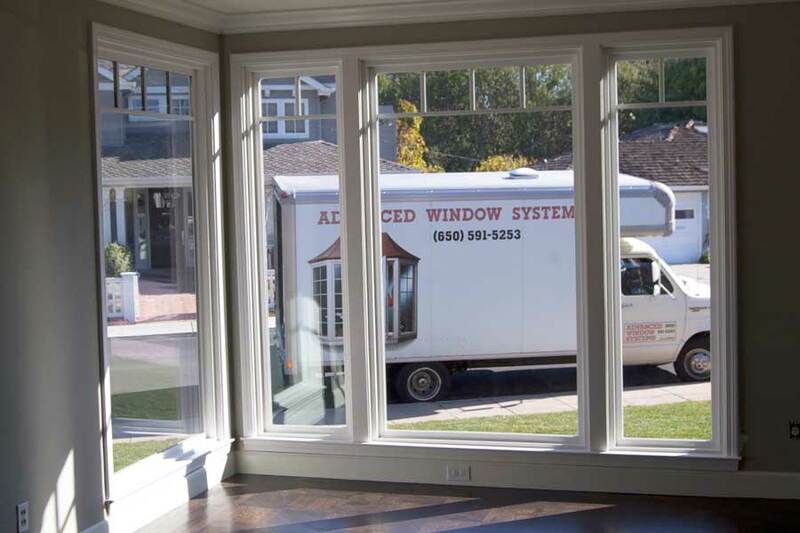 Bay windows make a dramatic improvement inside and out! 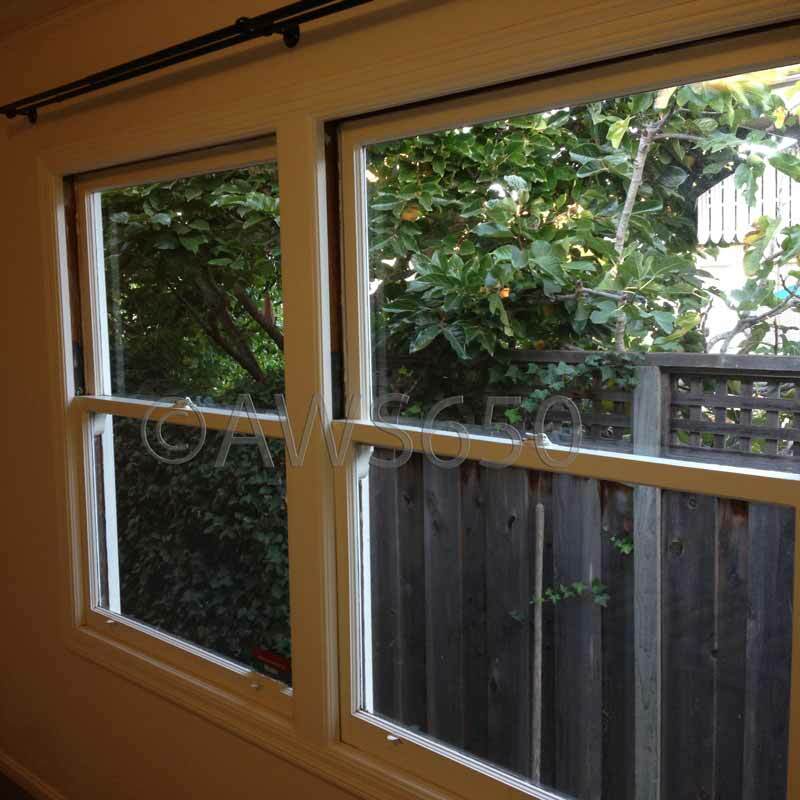 Before Photo of existing aluminum casement window. 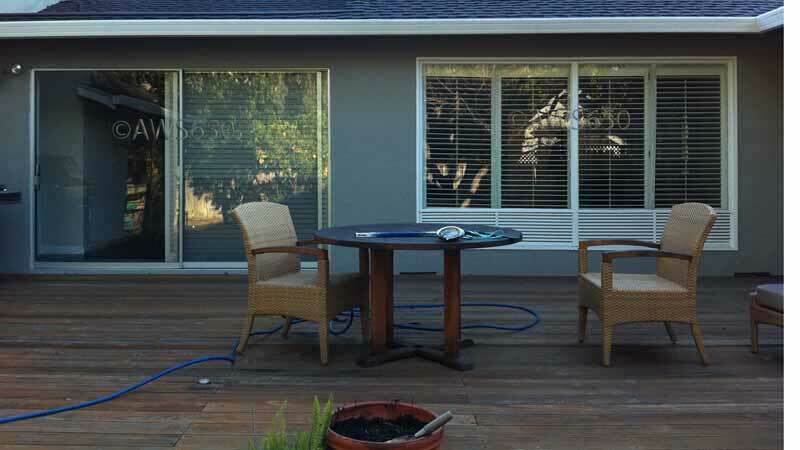 Milgard Tuscany Vinyl Windows and Patio Doors installed over stucco with a Z-Bar Frame. 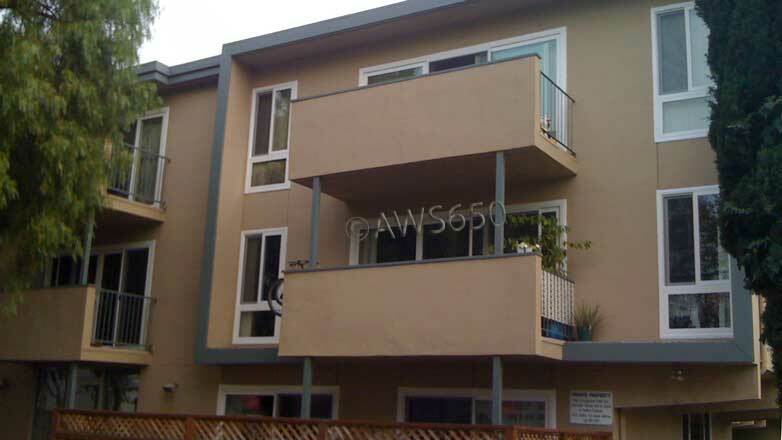 This apartment building window installation is in Redwood City. 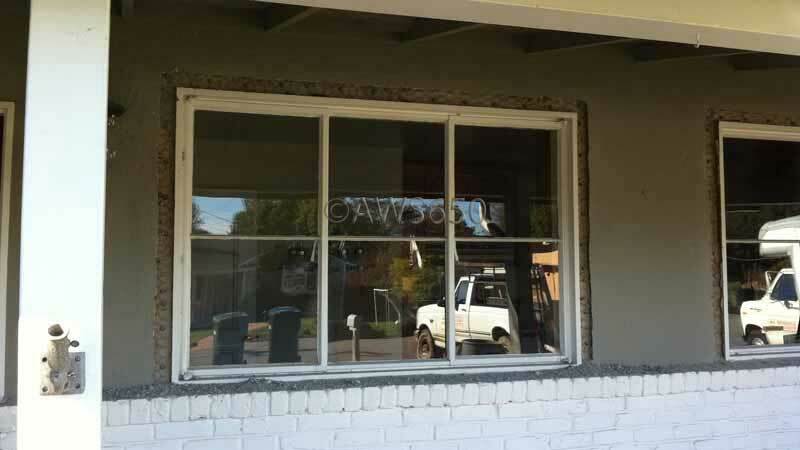 All of our Z-bar installations are bedded into commercial grade caulking and sealed again after the window is set. 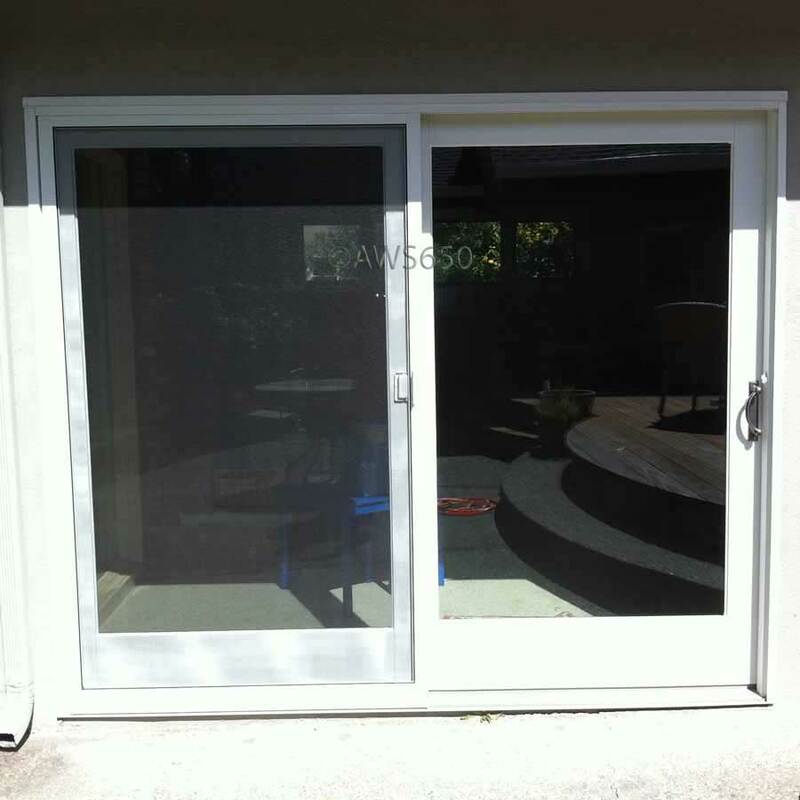 Before Photo of existing aluminum single glazed patio door. The original perimeter frame was left in tact as part of the installation. 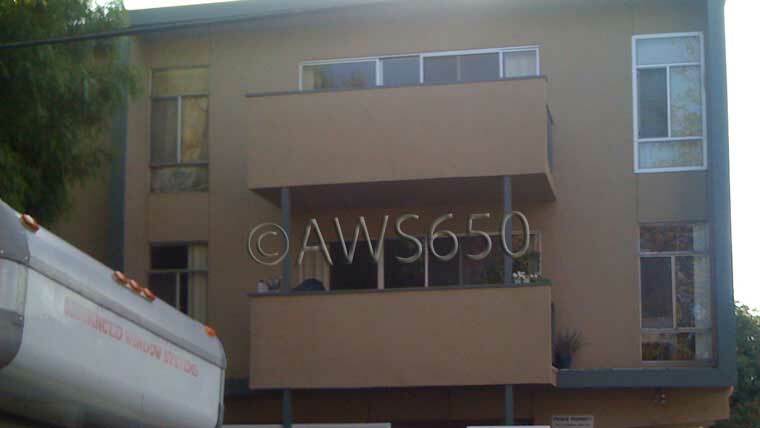 When we do apartment buildings we break it down to 1-2 units a day. 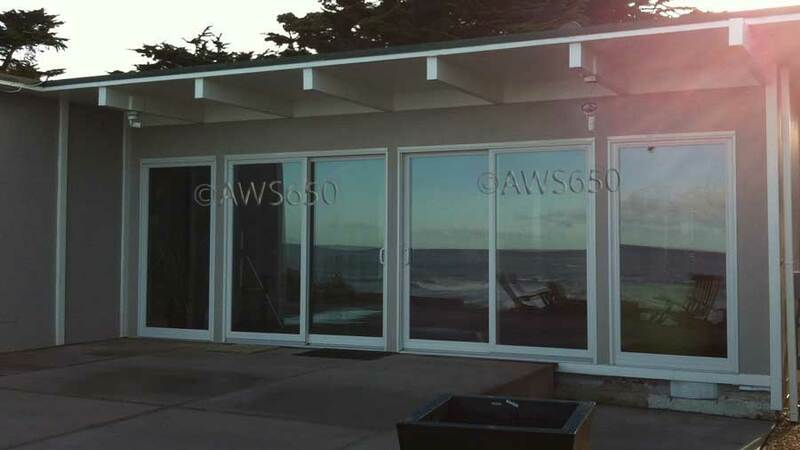 Andersen 200 series Perma-shield patio doors installed on ocean in Moss Beach,Ca. 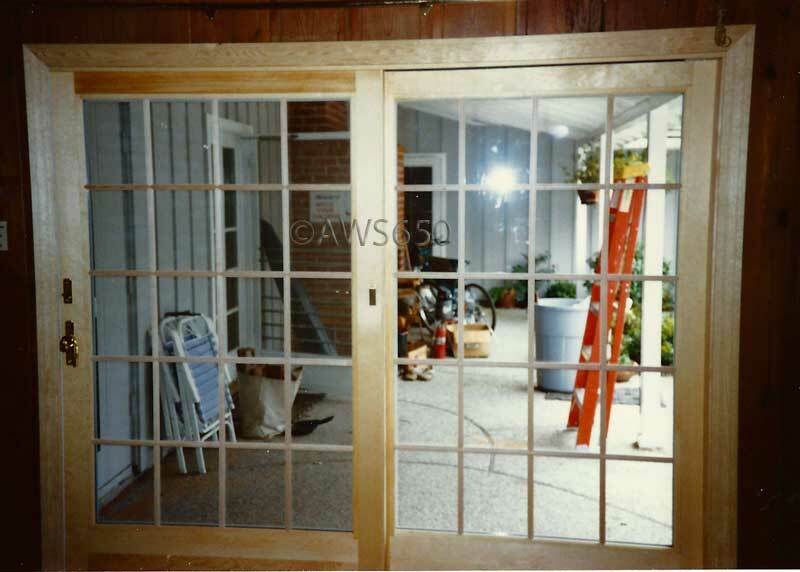 Before of Aluminum single glazed patio door and plate glass inside the wood posts. The background photo is the whole back wall. I did all the stucco patching on the wall . The background photo is of mid construction during the flashing process. Background photo is a interior view. This door is a 12'x 6'8" 3 panel Perma Shield. Before of plate glass inside the wood posts. I did all the stucco patching on the rear wall. 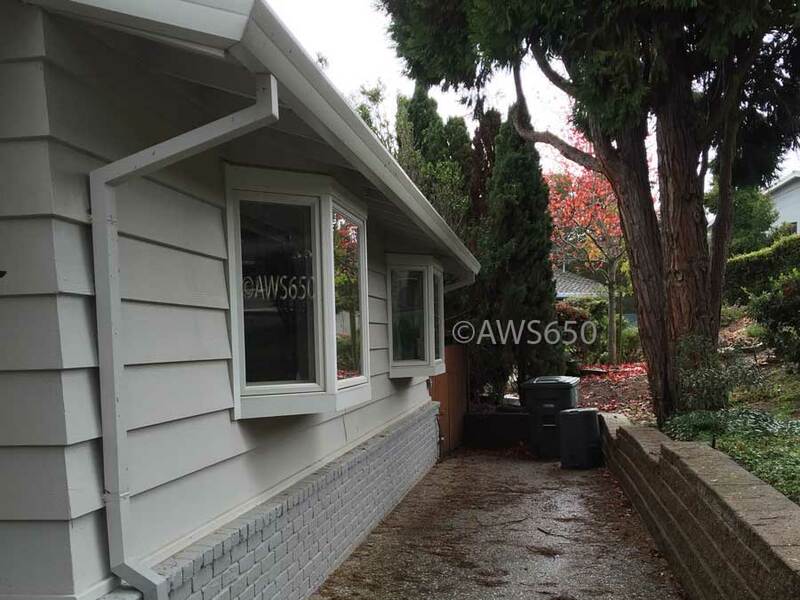 Two Andersen 400 series casement Egress Bays installed in Belmont,Ca. 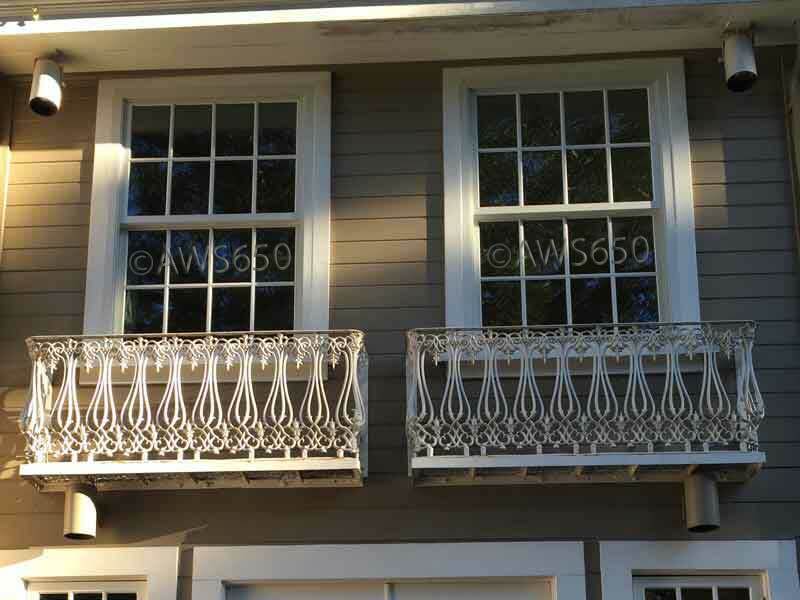 The sills were lowered on both windows to meet code and let in additional light. 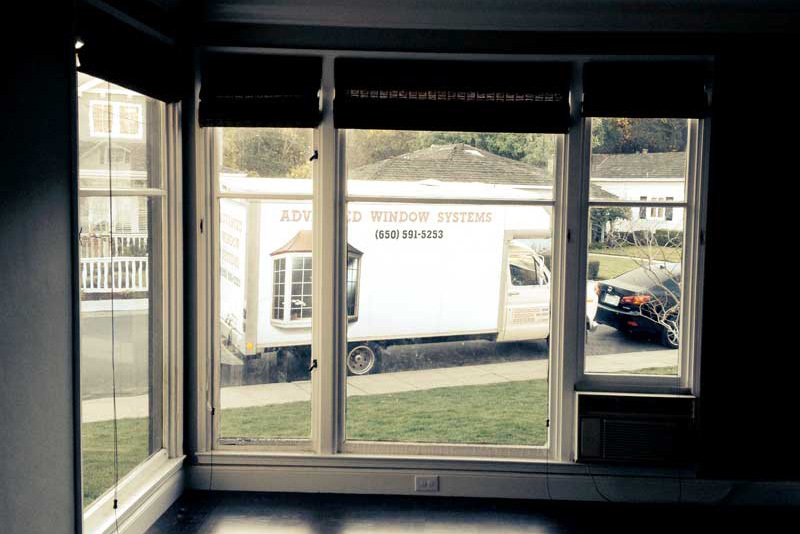 Before pictures with the Andersen Bay windows ready to be installed. Sills were lowered to meet Egress and let in additional light. 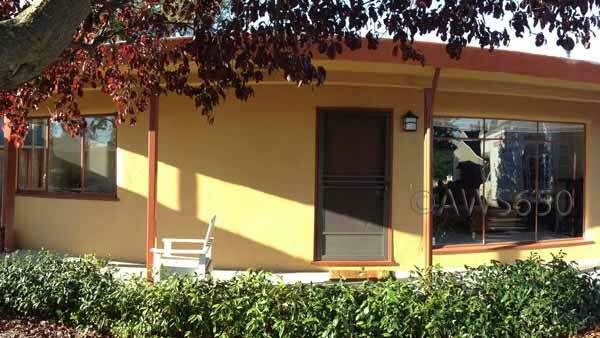 Milgard Tuscany chocolate exterior premium paint Vinyl Z-Bar Frame. 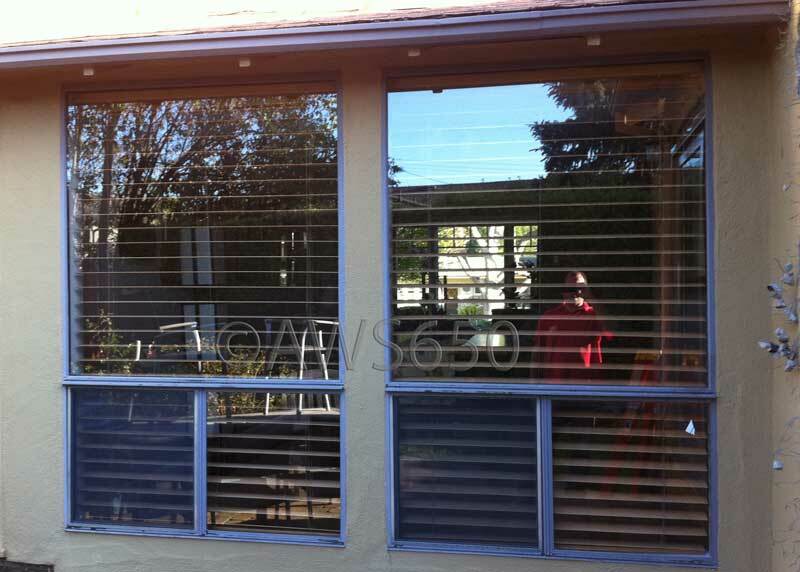 Installed over steel frame windows. This installation is in a church in San Mateo,Ca. 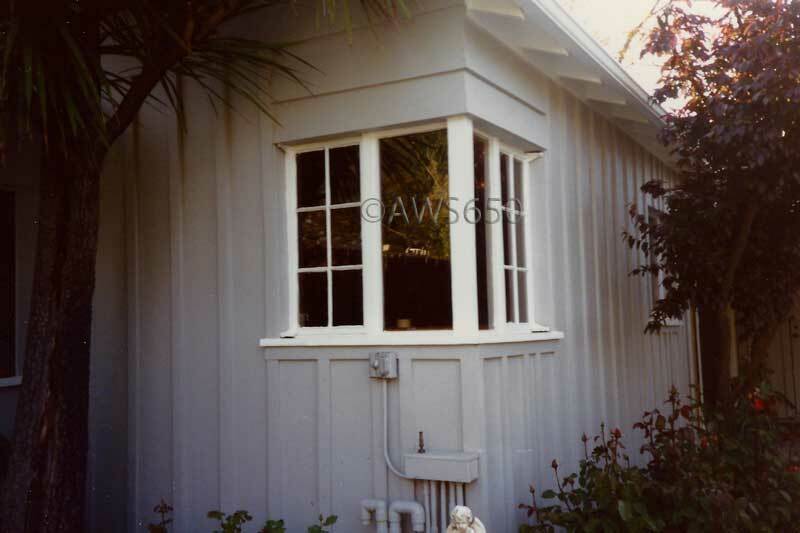 Before image of original steel framed window. 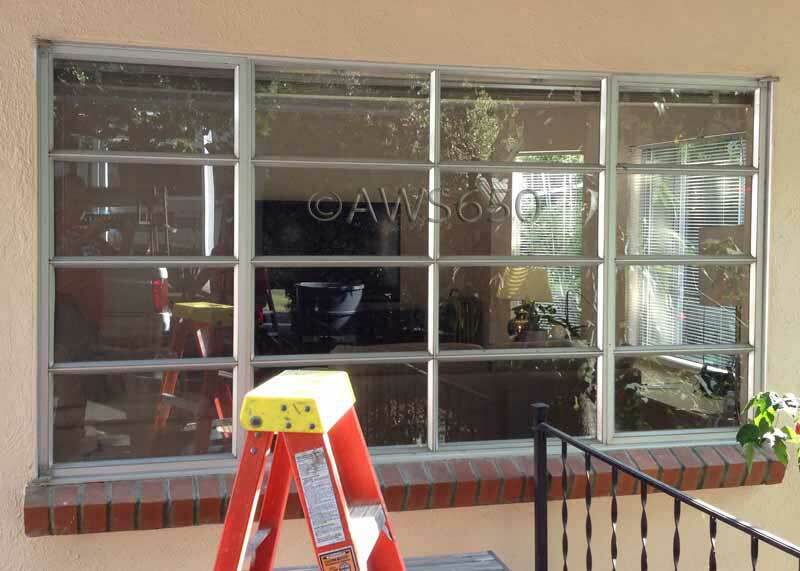 Background image is a after photo of the white interior of the new window. 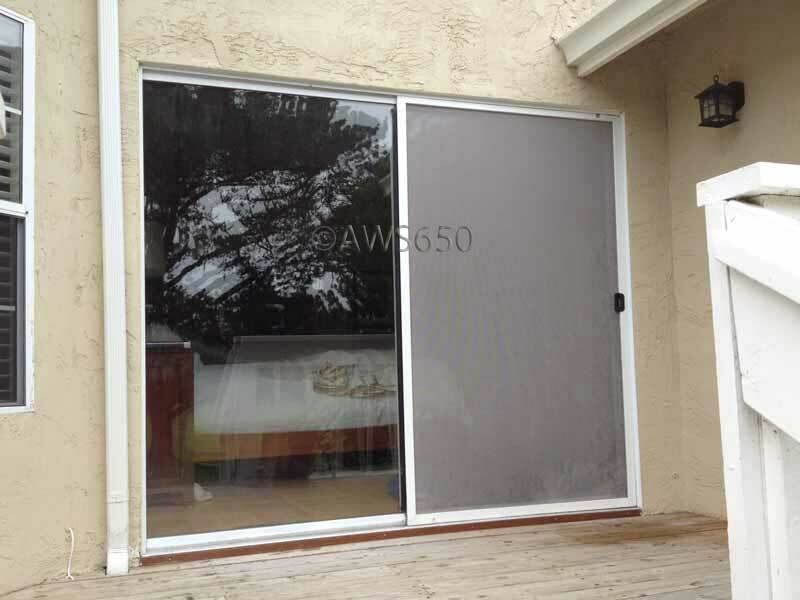 Milgard Tuscany 3 panel Vinyl Patio door installed over stucco with a Z-Bar Frame. 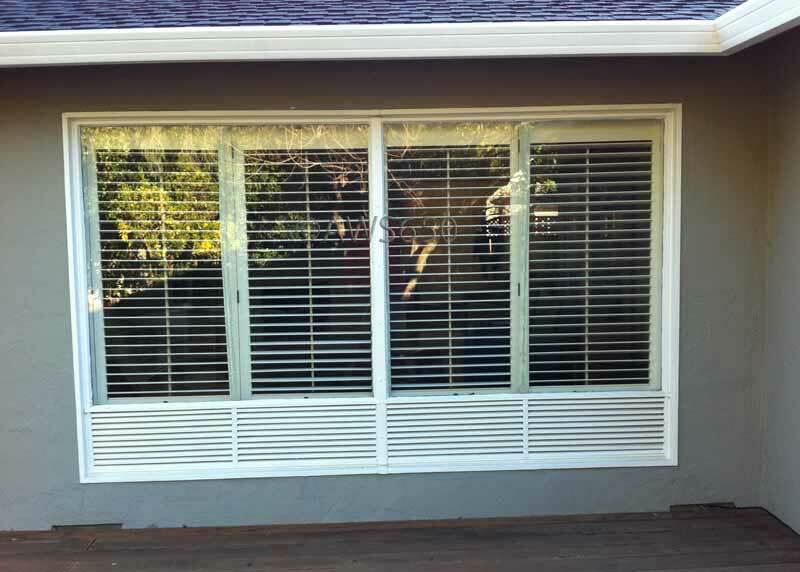 Andersen 400 Series Casement Bay Installed in San Carlos on the Alemeda. 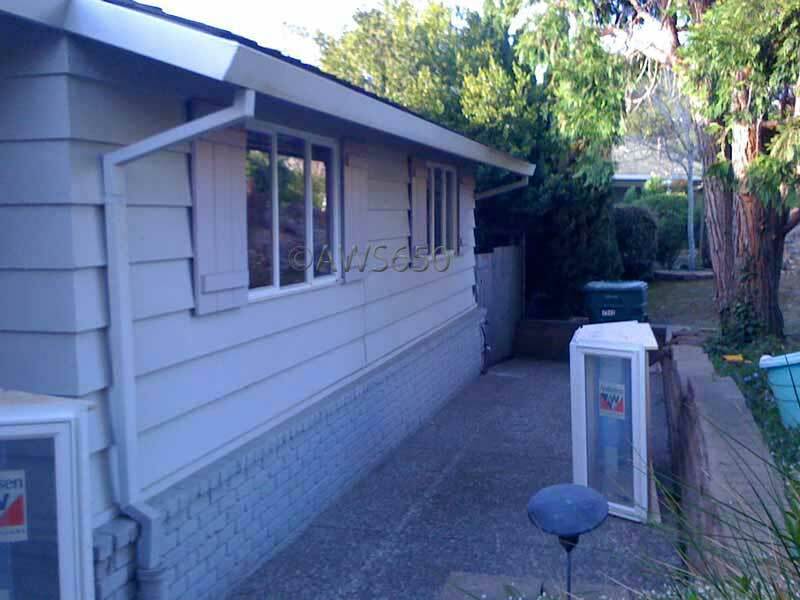 Before photos of the exterior and interior. 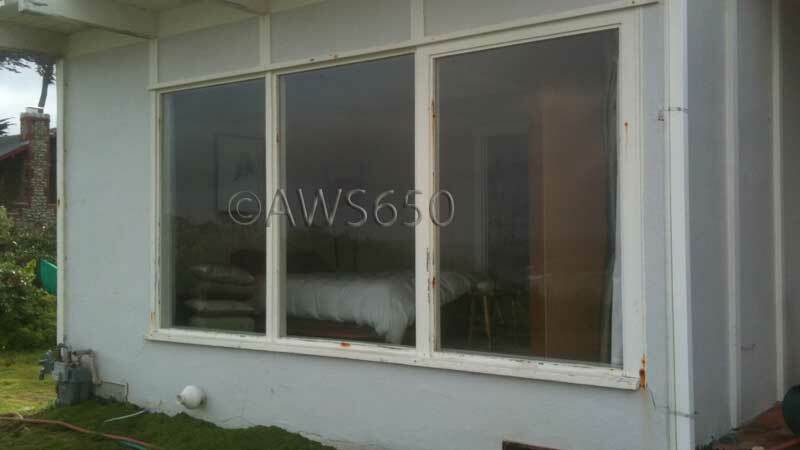 Before picture of the original steel frame window with one sash already removed. 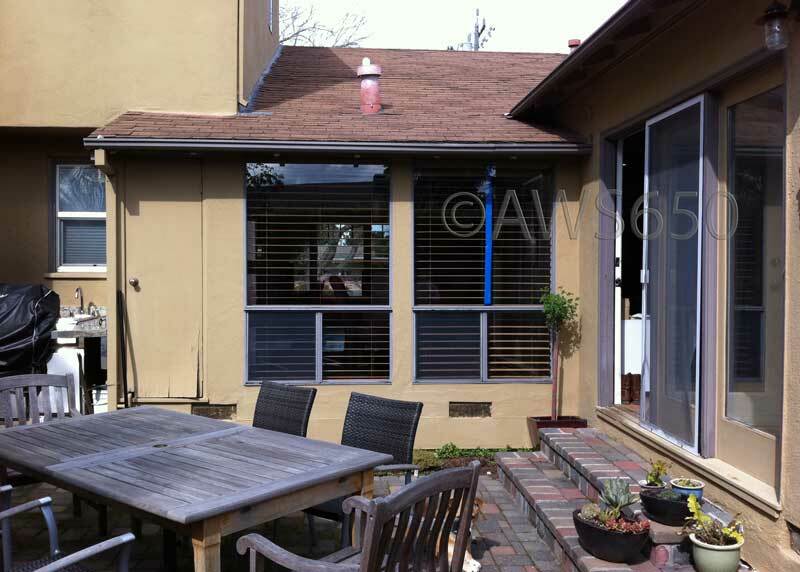 Milgard Greenhouse window installed in San Mateo,Ca. Milgard Tuscany Vinyl with Chocolate exterior color installed over bull nose stucco with a Z-Bar Frame. Tempered glass was required on this window as it was within 18" of the floor. 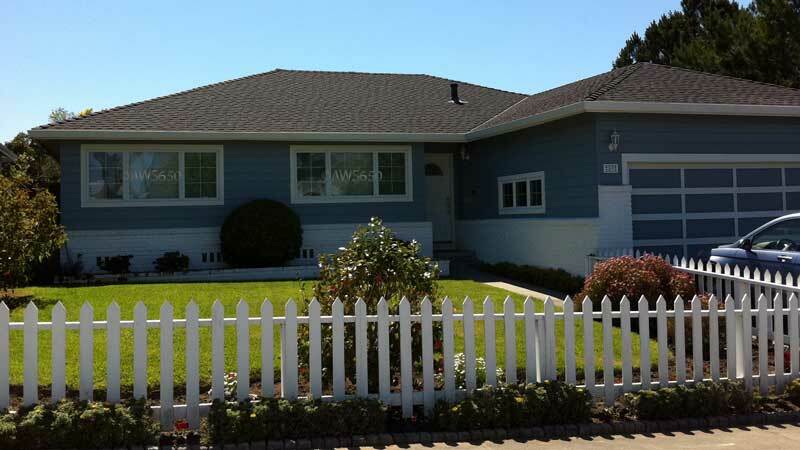 This installation was done in the village of San Mateo. Background photo is white interior and both sides slide open. Before photo of original steel frame in bull nose stucco. 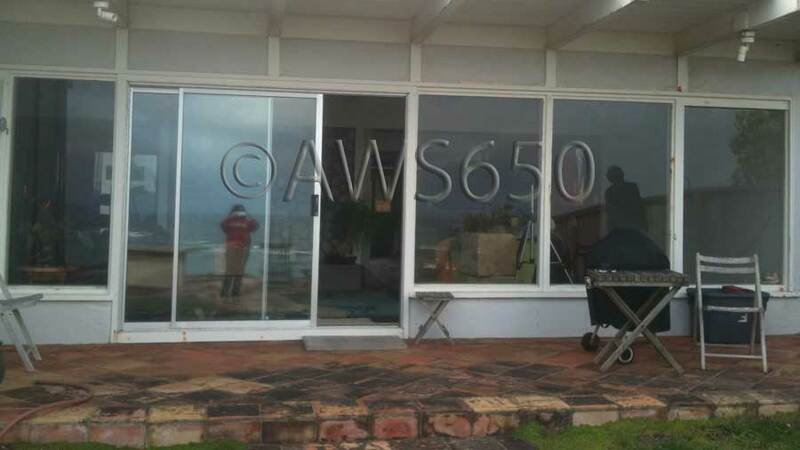 The window size is 96 x 72. The original perimeter frame was left in tact as part of the installation. This window didn't open and did not have tempered safety glass. 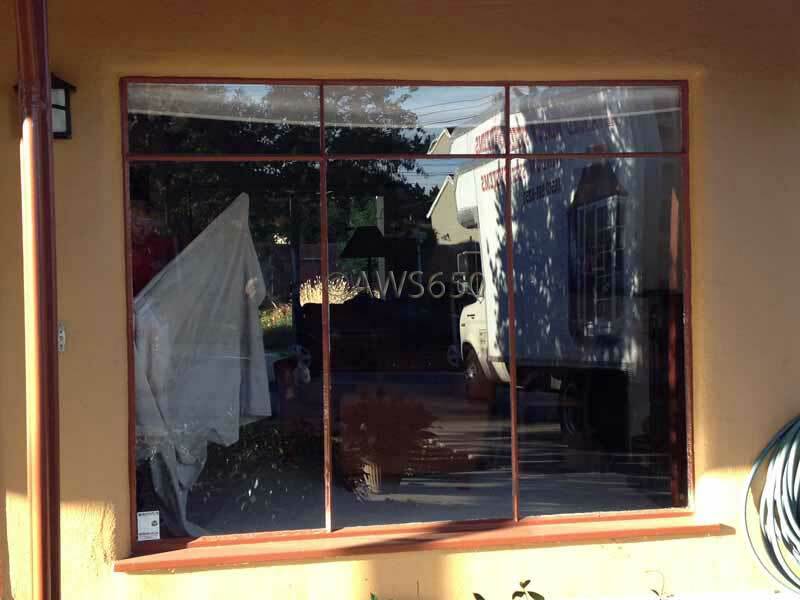 This is a very common window in the village in San Mateo. 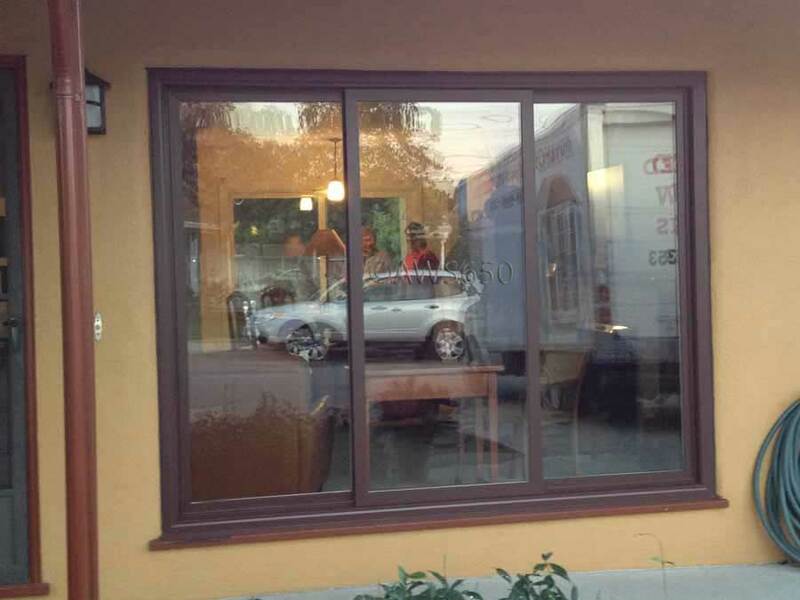 Milgard Tuscany Vinyl windows with premium exterior chocolate paint. 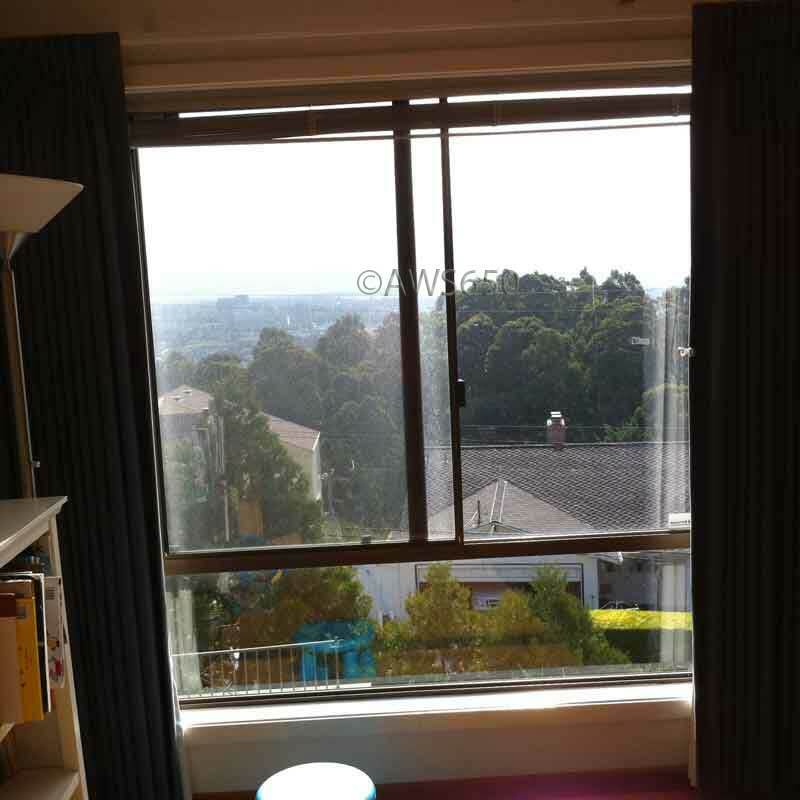 Left bedroom window was changed to two panel window to meet egress code. 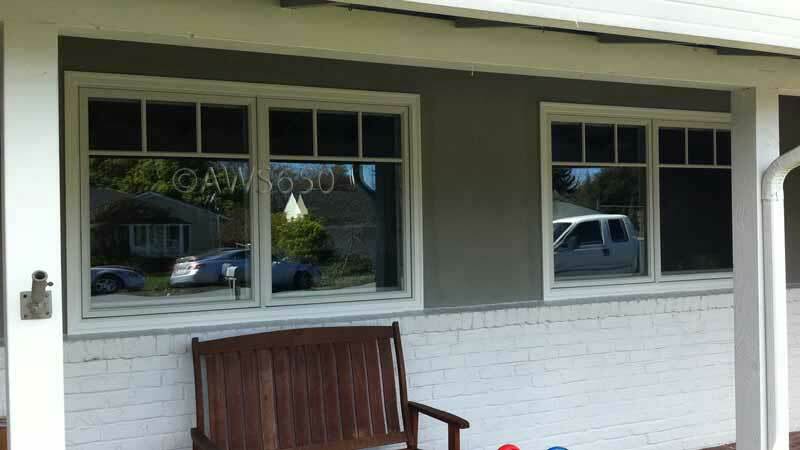 Milgard Tuscany Vinyl window with premium paint over stucco with a Z-Bar Frame. 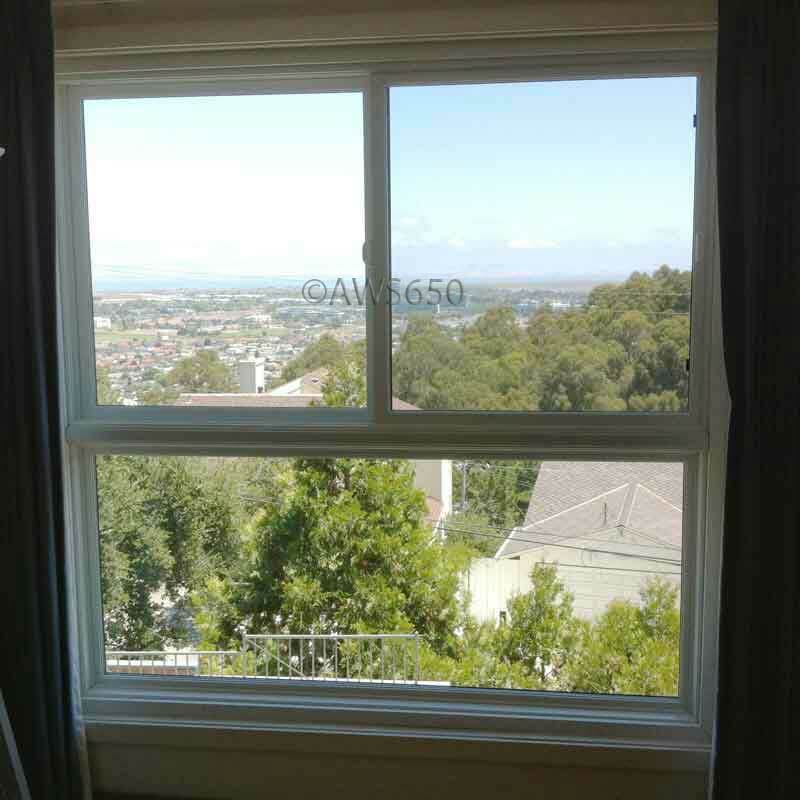 This is a pretty common window installation in the San Mateo village. Before photo of aluminum window that hat already been changed once. The stucco job around this window was of poor quality. 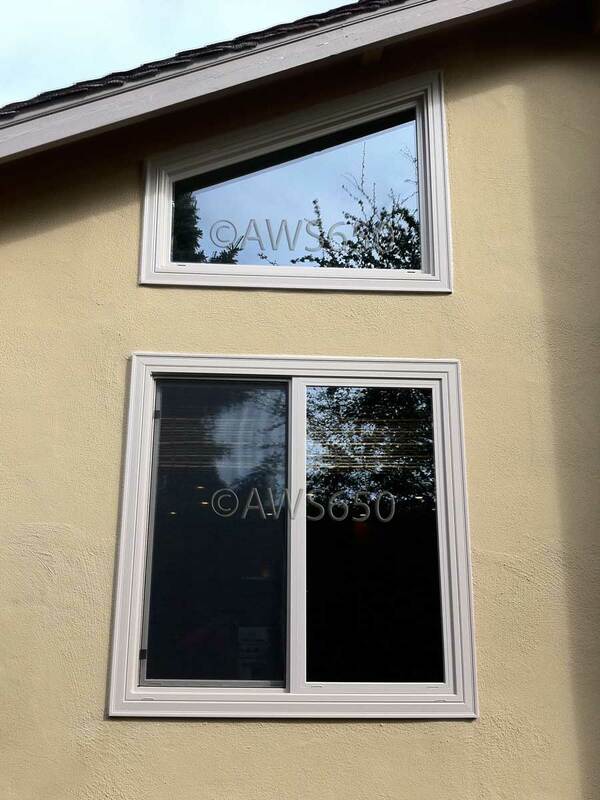 Milgard Tuscany Vinyl replacement window installed over stucco with a Z-Bar Frame in Menlo Park,Ca. 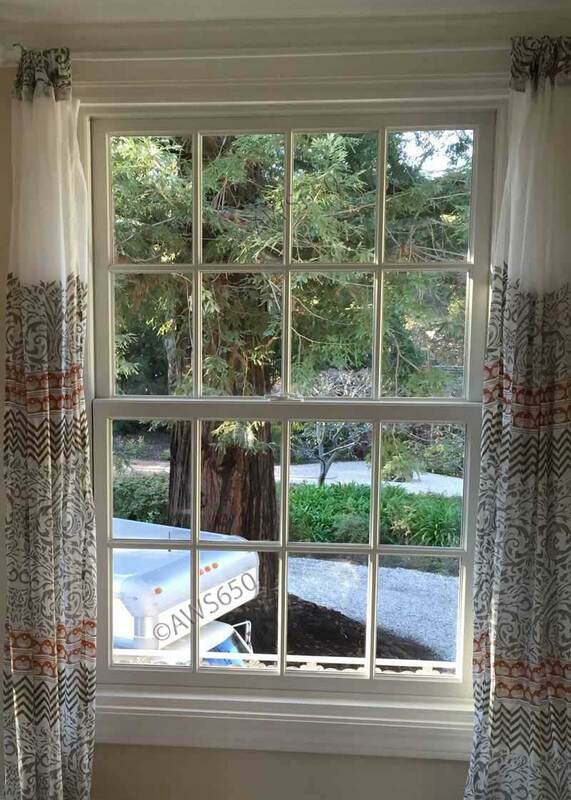 Andersen 400 Series Casement windows with valance S.D.L.grid installed in Los Altos. 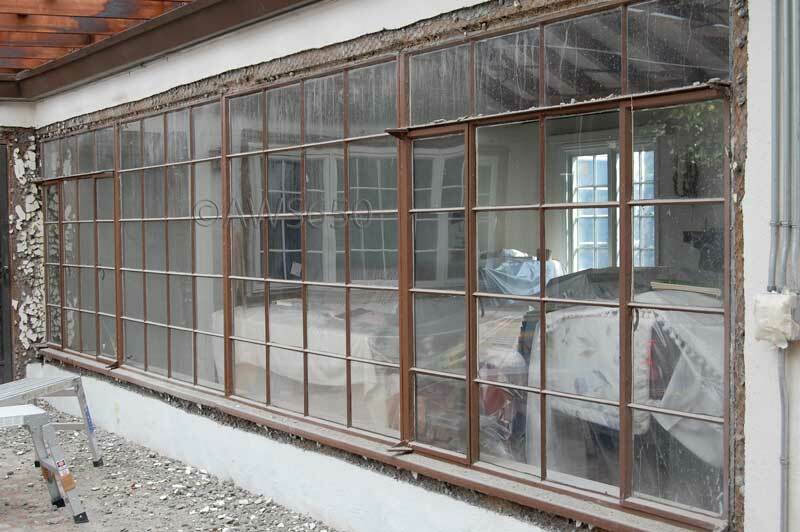 Before photo of original steel windows. 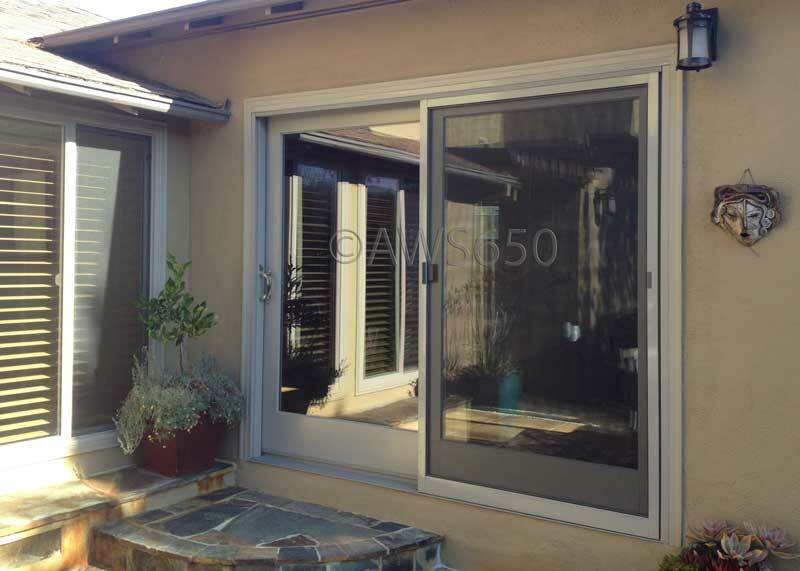 Milgard Tuscany Vinyl Patio door and window installed over stucco with a Z-Bar Frame in Menlo Park. 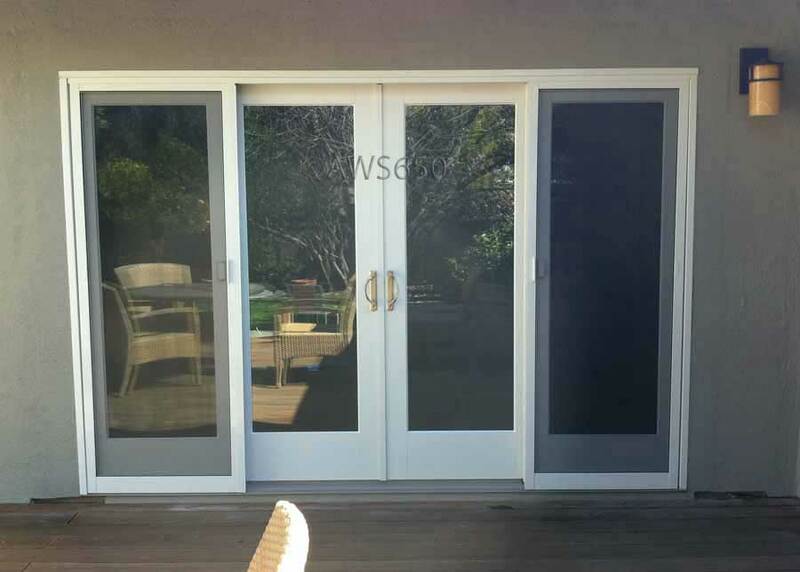 Andersen 400 series Frenchwood Door installed in stucco. 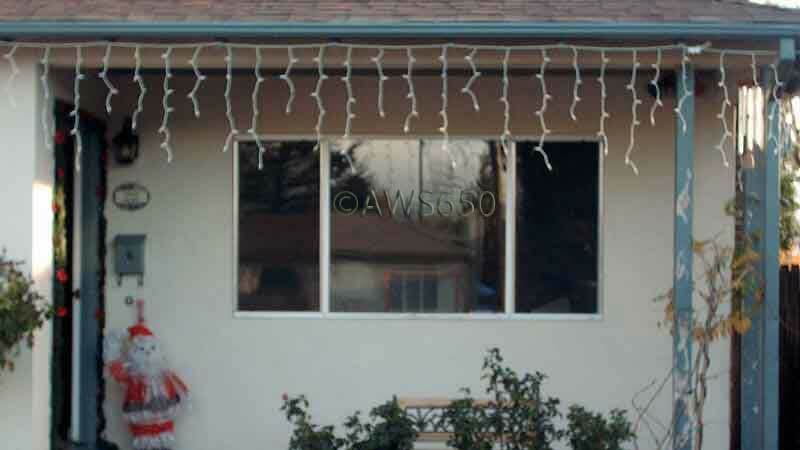 Light was required as part of door installation and done by us along with all the stucco patching. 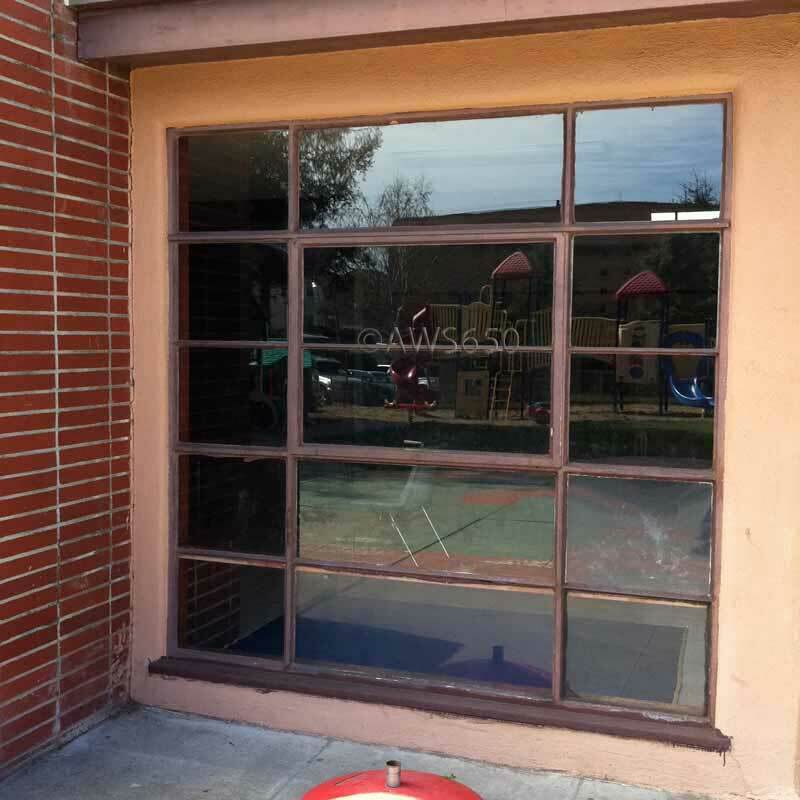 Before photos of exterior and interior steel window. The opening is 10' x 6' 8". Before photo of 2 panel door and window turned into door with new exterior light. 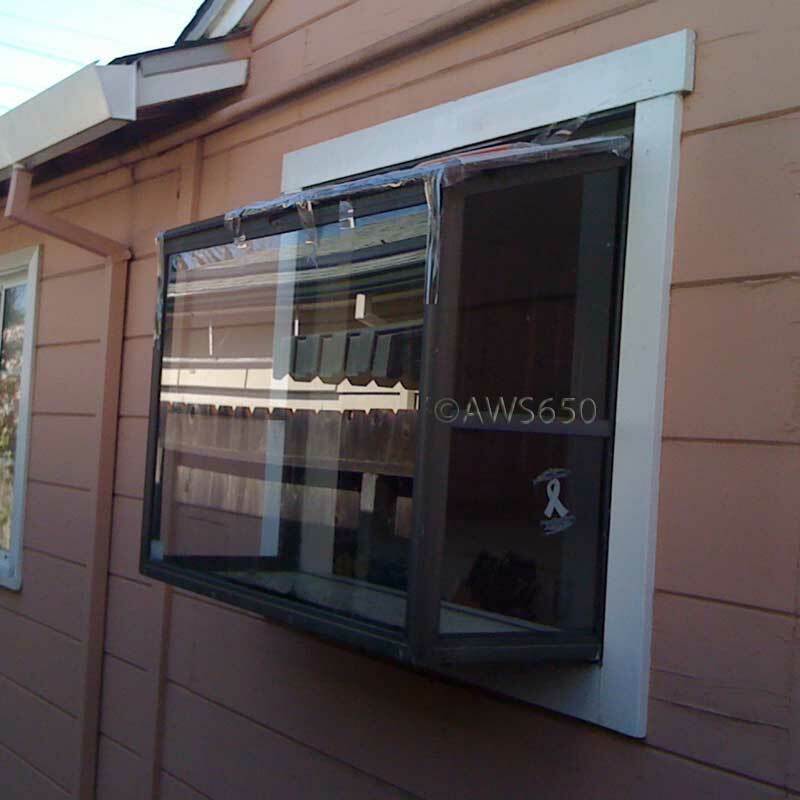 Andersen 400 series Casement window with simulated divided lite (S.D.L. 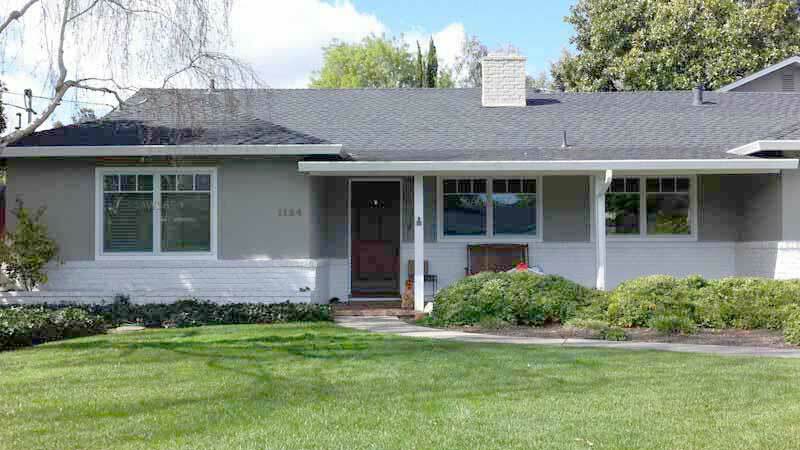 )grids installed in Los Altos,Ca. 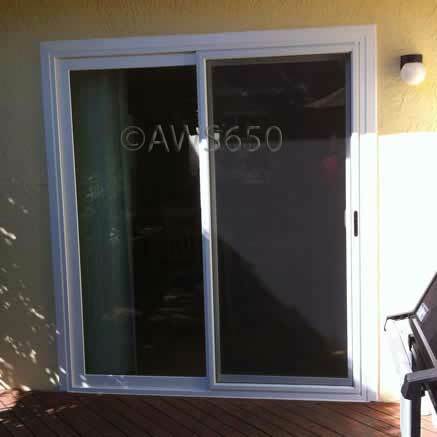 After photo of new construction installation of a Andersen 8 foot wide Frenchwood Gliding patio door. After photo of interior is stain grade with custom milled pine 1/2 thick done on job site with our portable planer. 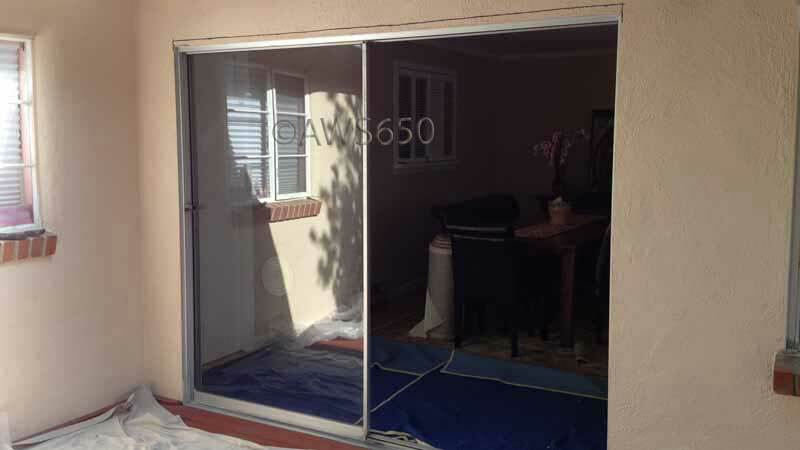 Before of aluminum single glazed patio door. 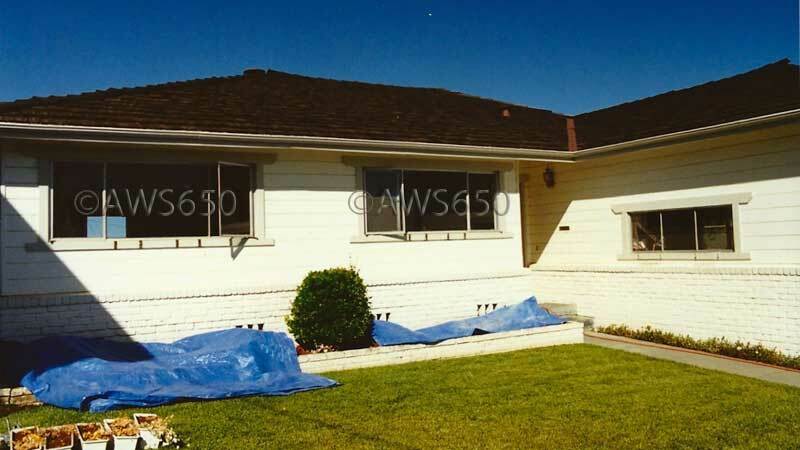 Stucco was broken back with a pneumatic air chisel, flashed inspected and re-stucco by us. 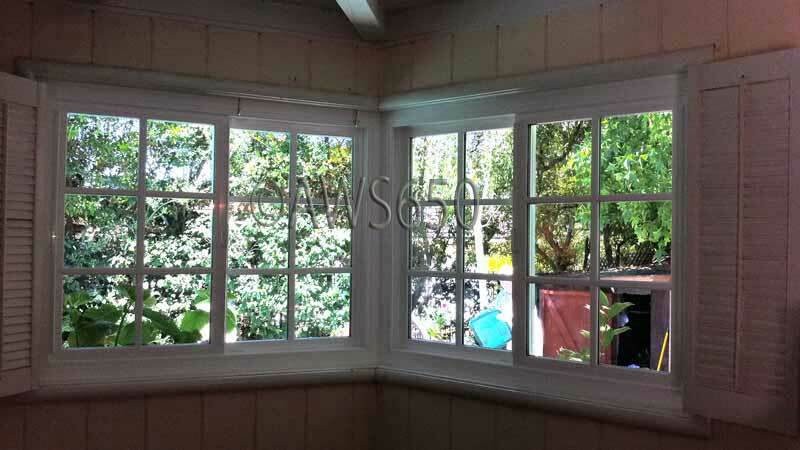 Andersen 400 Casement windows with Valance S.D.L. grids. 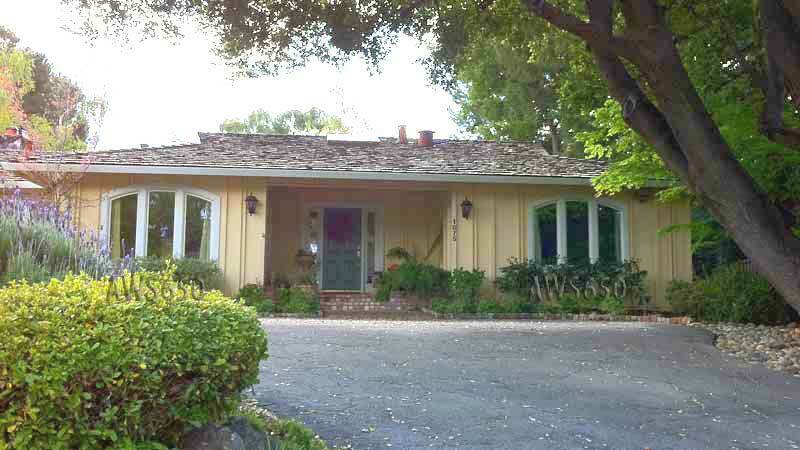 2" wood stucco molding bordering the exterior of the front windows. 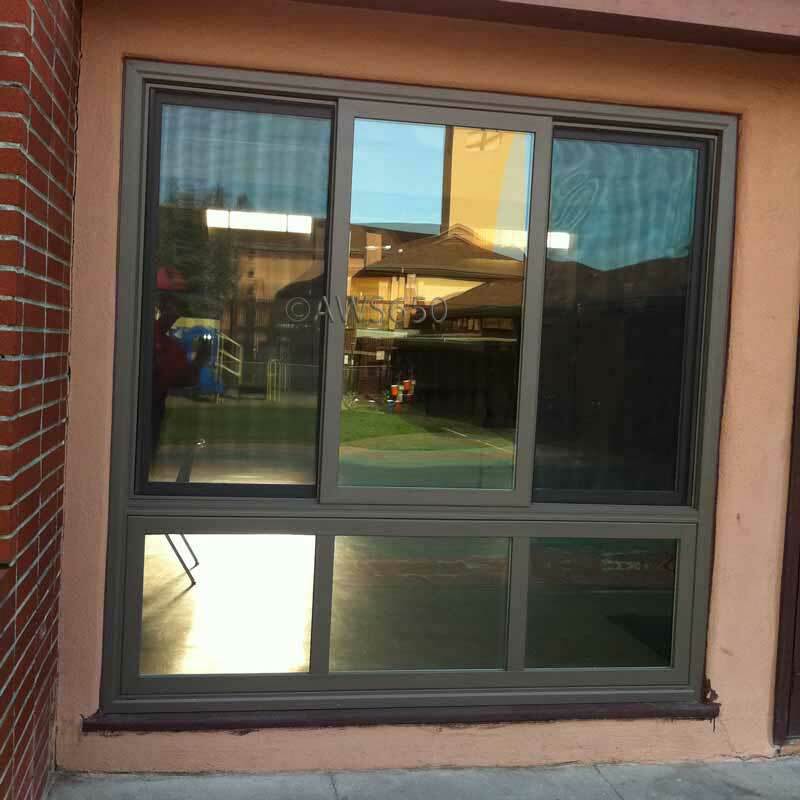 Milgard Tuscany Vinyl sliding window with S.D.L. 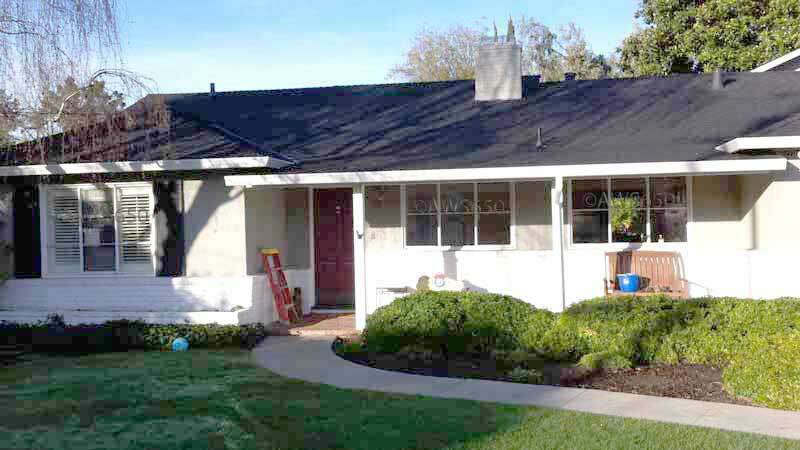 grid installed is Hillsborough,Ca over stucco with a Z-Bar Frame. 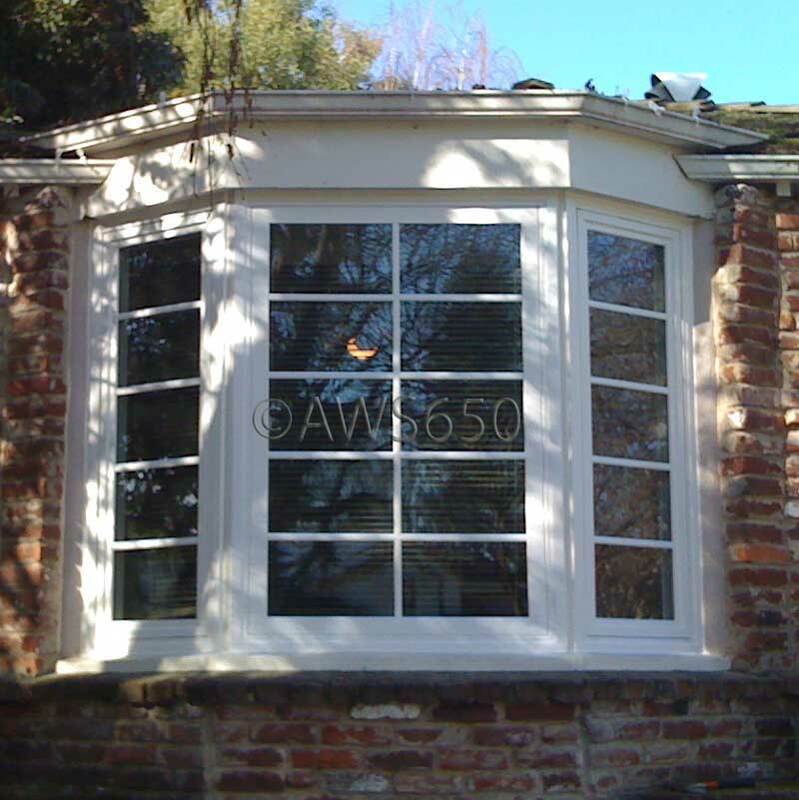 Andersen Woodwright Double Hung windows installed in Atherton,Ca. This window was installed in the original opening. 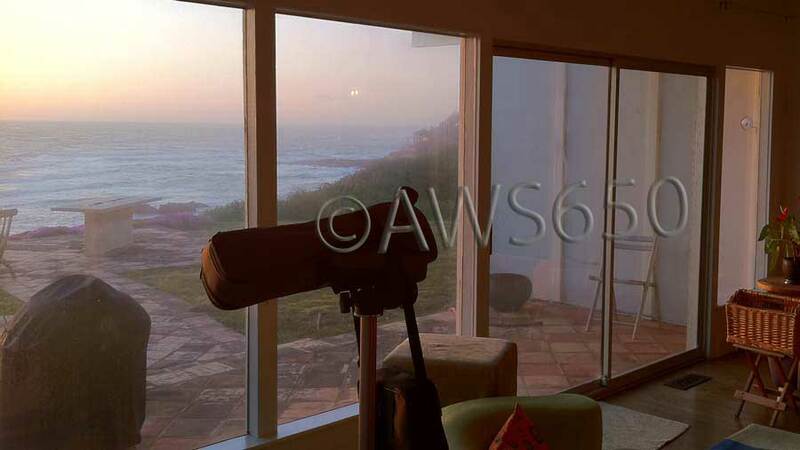 This window has Simulated divided lite and pure view screens. Both the top and bottom tilt in for cleaning. 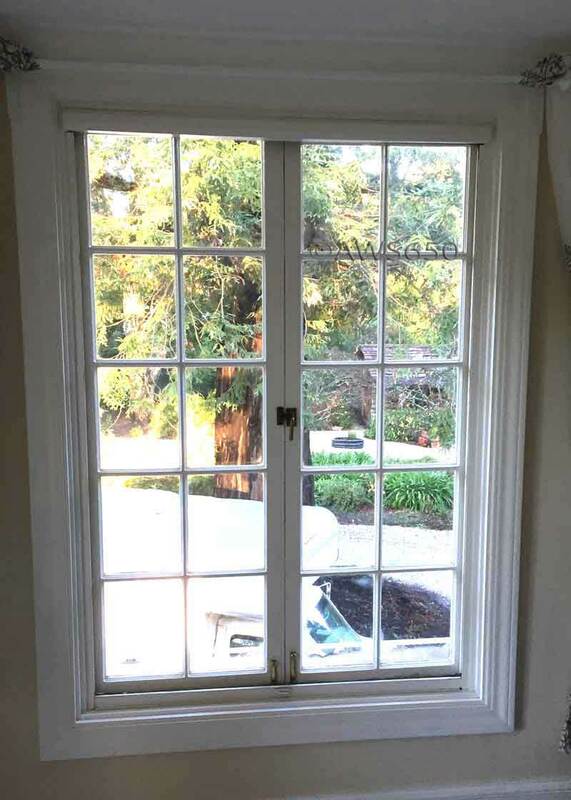 Before photo of original wood casement window. 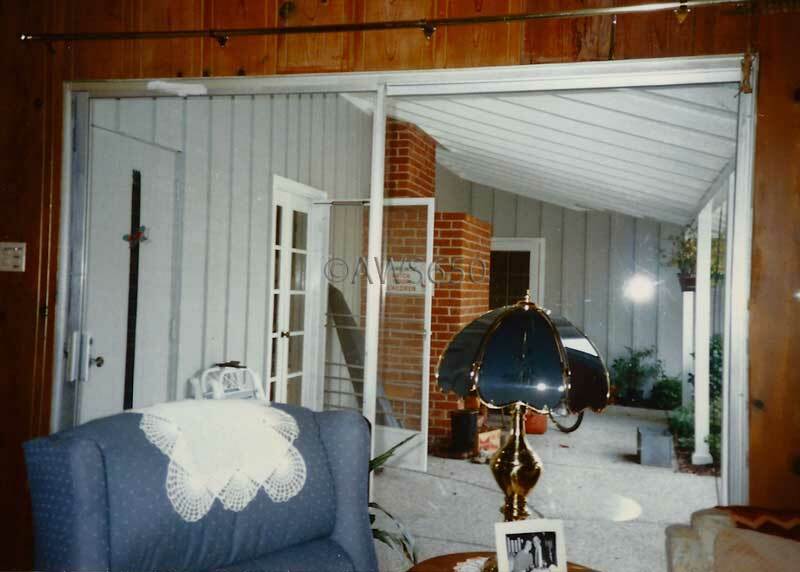 The original windows were very drafty and had interior roller screens that were unsightly and did not work. 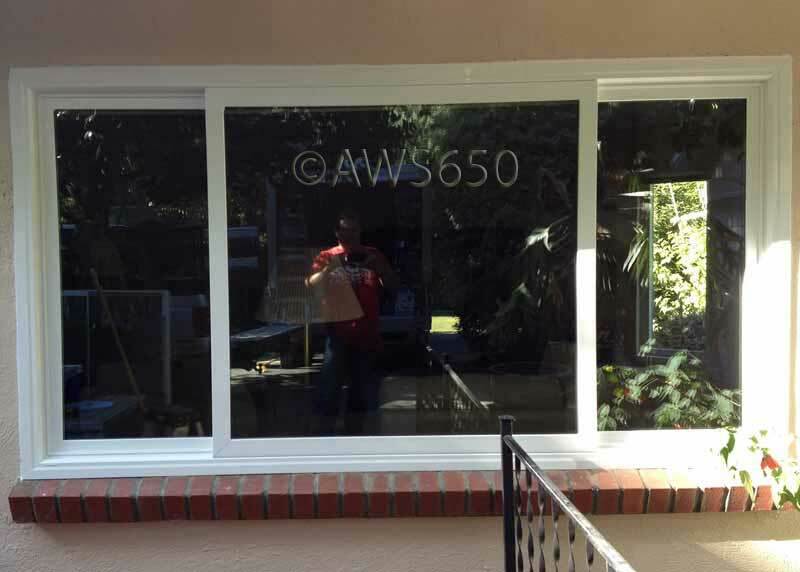 Andersen Woodwright Double Hung replacement windows installed in Atherton,Ca. Back image is of the other double Hungs installed in the room. 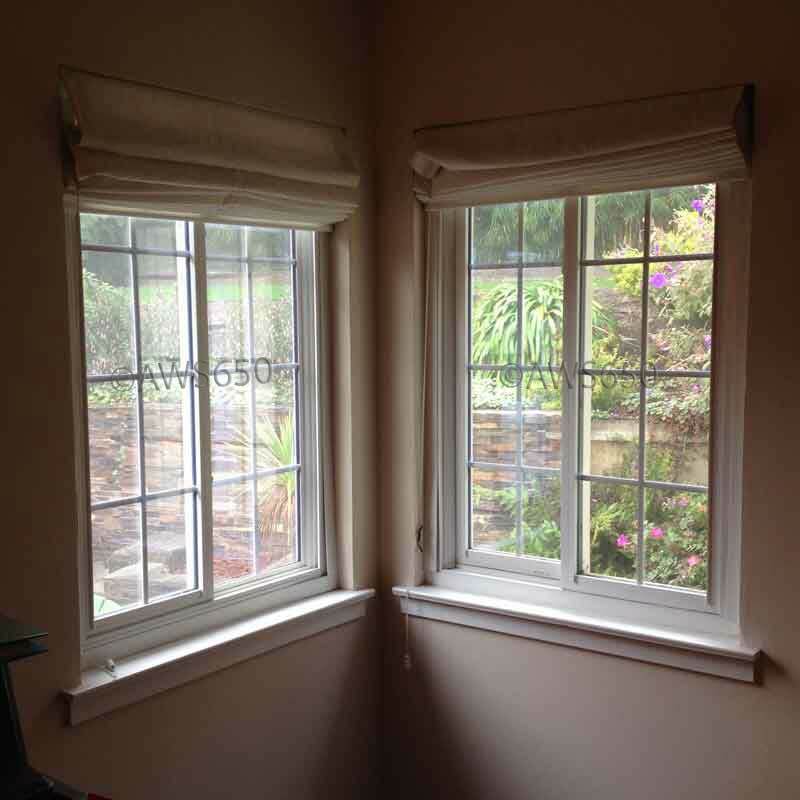 Before photo of original single pane wood casement windows. 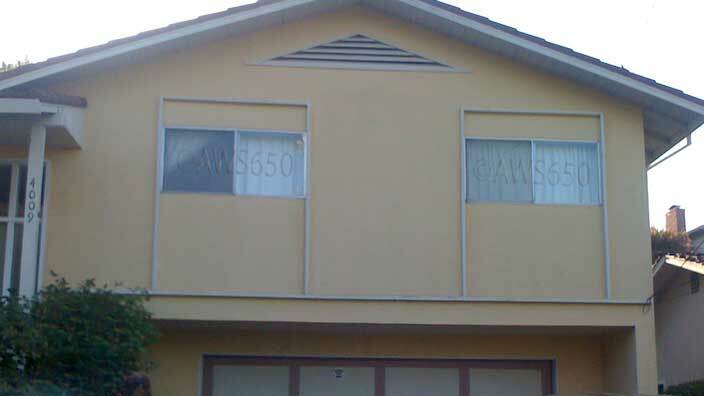 The windows were changed to double Hungs to match the other windows on the upper floor. 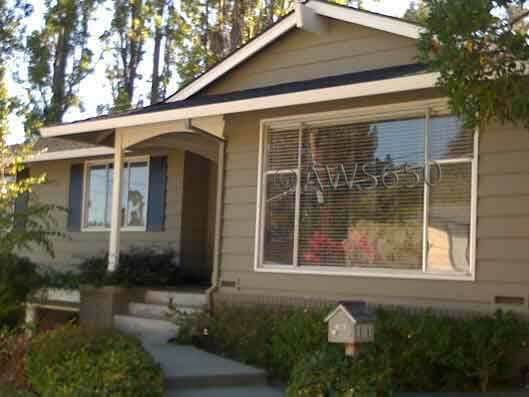 Andersen 400 series replacement vinyl clad casement windows with Low-e glass installed in Atherton,Ca. Before photo of original old wood casements. The old windows were very drafty and let in a lot of noise. 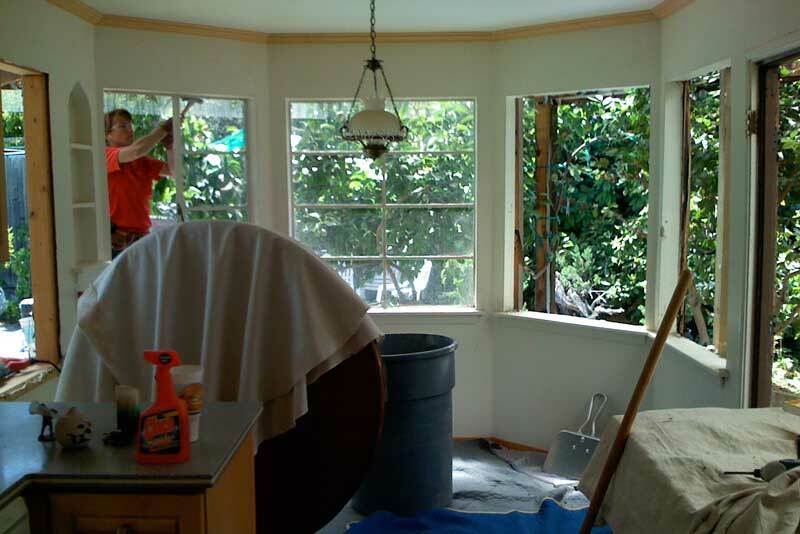 Milgard fiberglass replacement window with white interior. 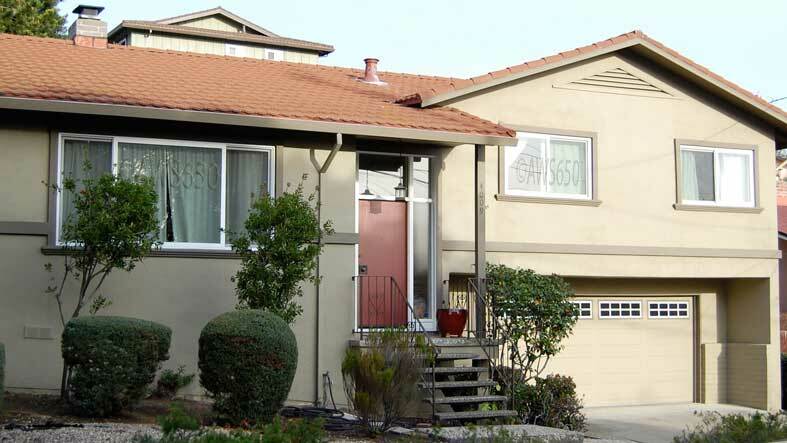 Background photo Milgard brown exterior fiberglass replacement window installed in Belmont,Ca. 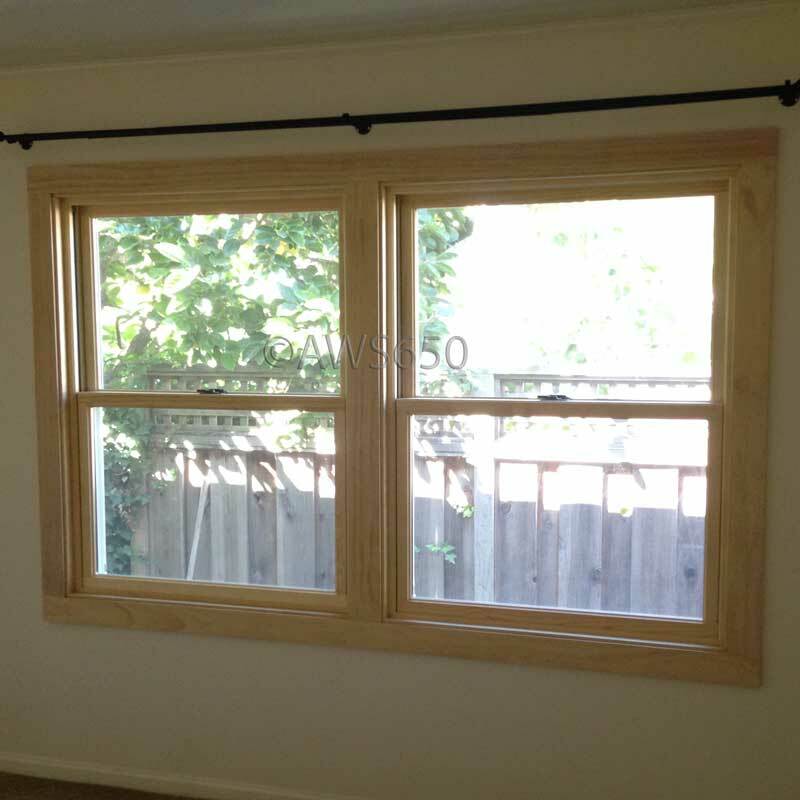 Milgard Vinyl single hung replacement window trimmed off in wood. Installed in Belmont,Ca. 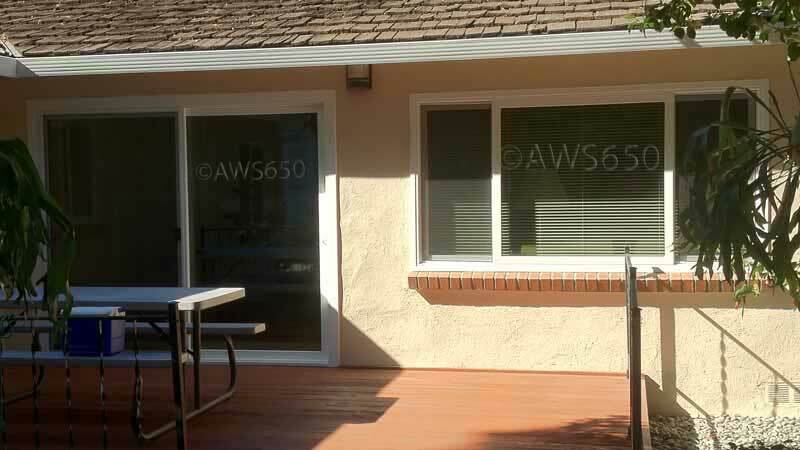 Milgard Vinyl replacement windows installed inside aluminum siding. Background photo of interior. 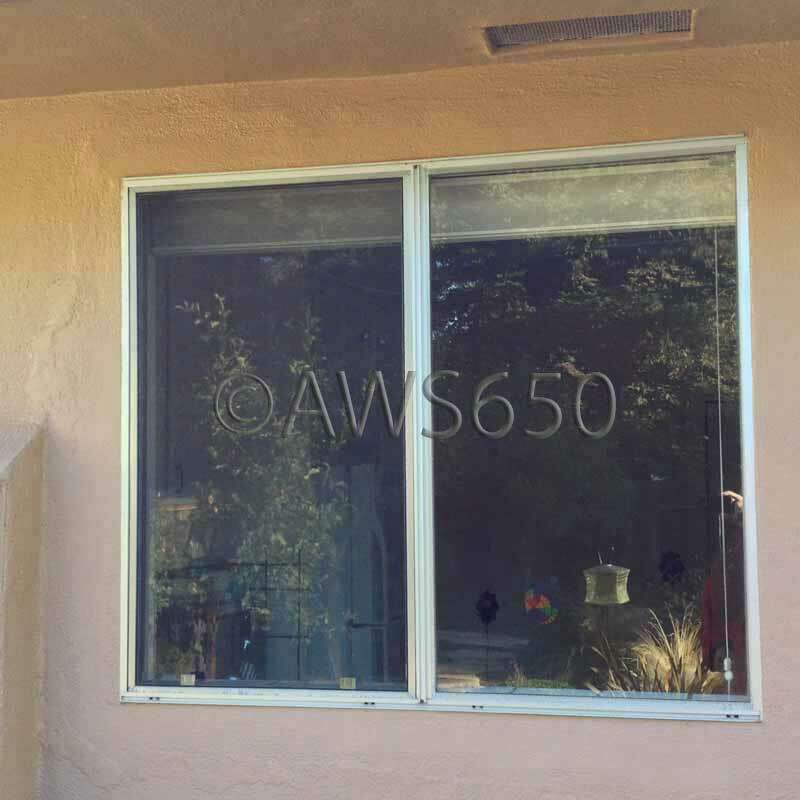 Before photo of aluminum replacement windows. 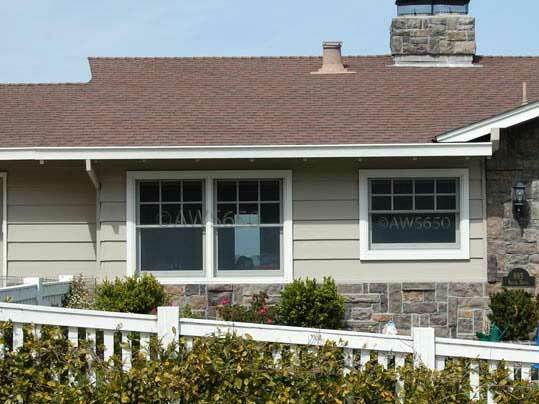 Milgard Tuscany Nail-on Vinyl windows installed in Redwood lapped siding. The new trim around the windows is 2 x 4 material and required cutting the siding back twice. This omits the gaps behind the exterior trim boards and makes for a better looking installation! 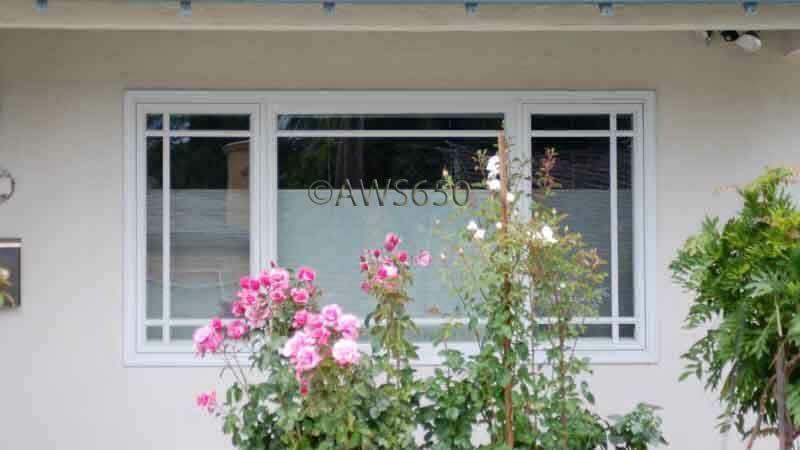 Before photo of single pane aluminum windows. 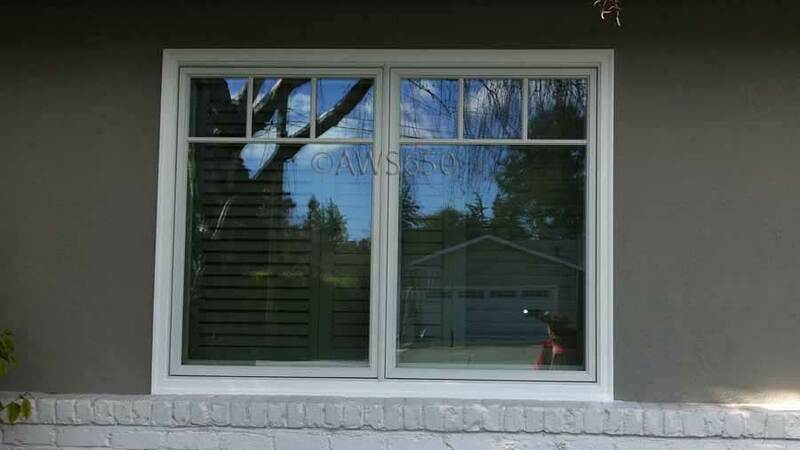 Andersen 400 series Casement Window with Prairie divided lites. 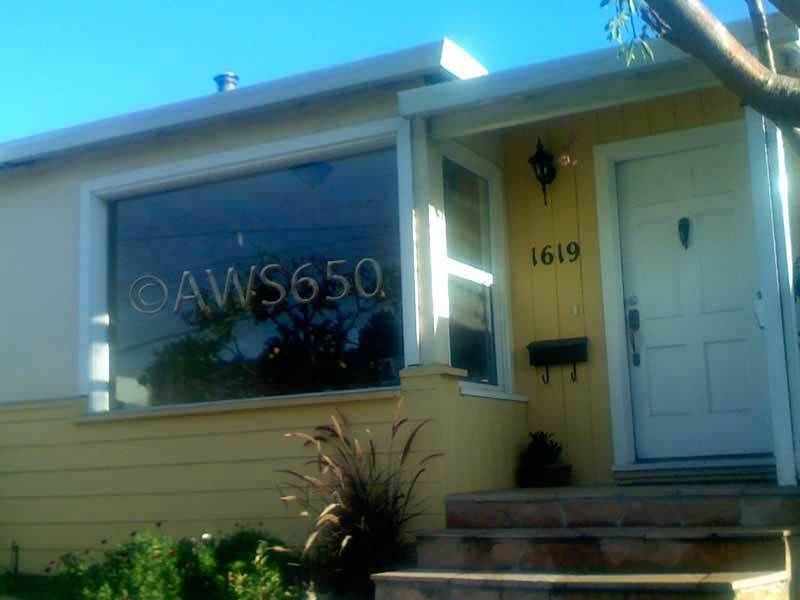 This window made a dramatic difference on the front of this San Carlos home! Before photo of aluminum single pane window. 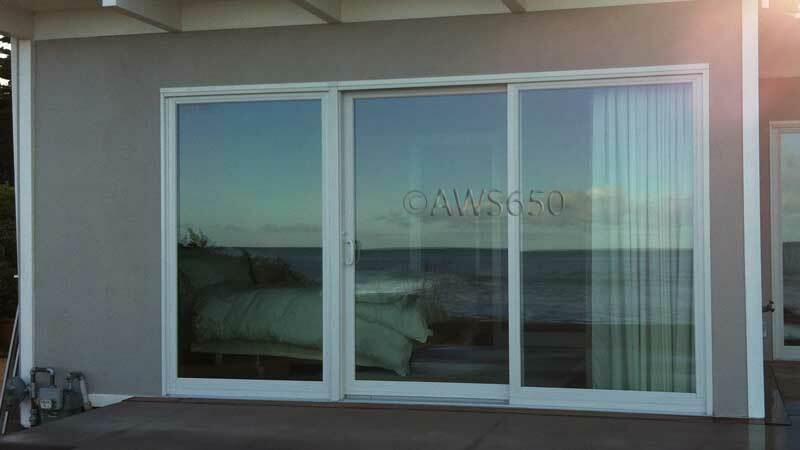 Before and After of Andersen Patio door installation in Moss Beach directly on the ocean. The background before photos are left side and right side next to each other. 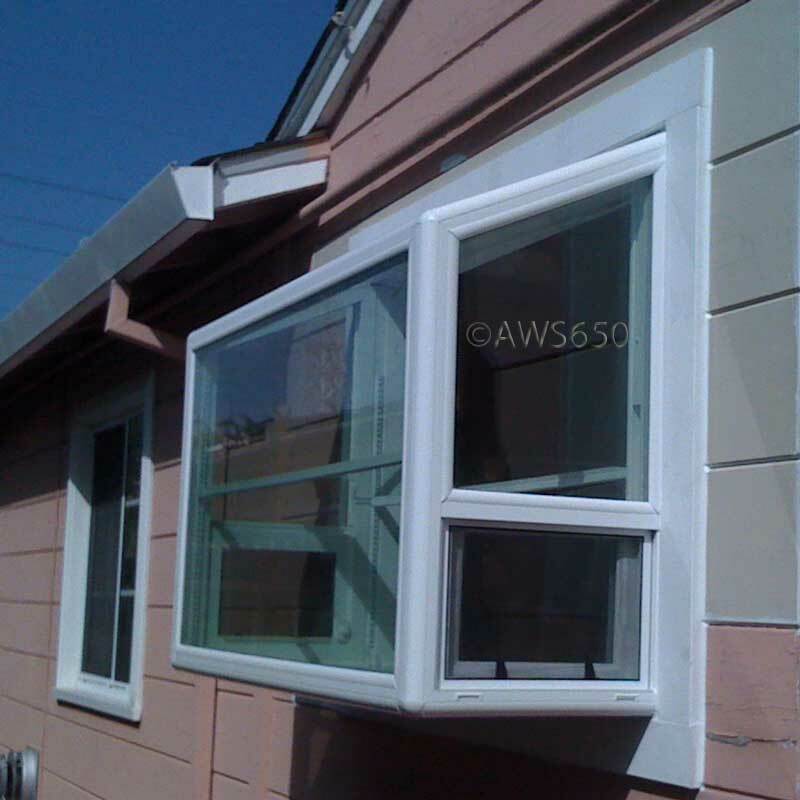 After exterior and interior photos of Andersen 400 series casement windows installed in Montera,Ca. 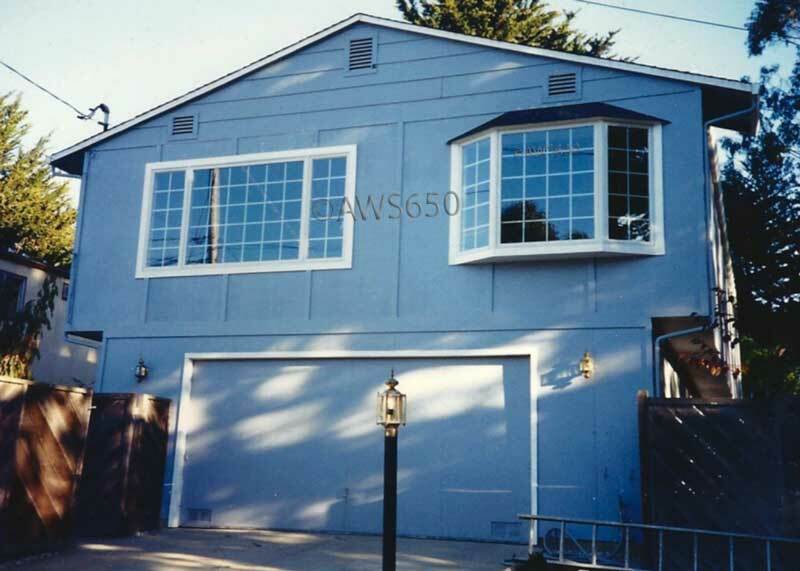 This was one of my first large jobs when I started Advanced Window Systems in 1989. Before of 12 foot aluminum window in center of wall. This wall and window would move in the wind prior to the new windows. 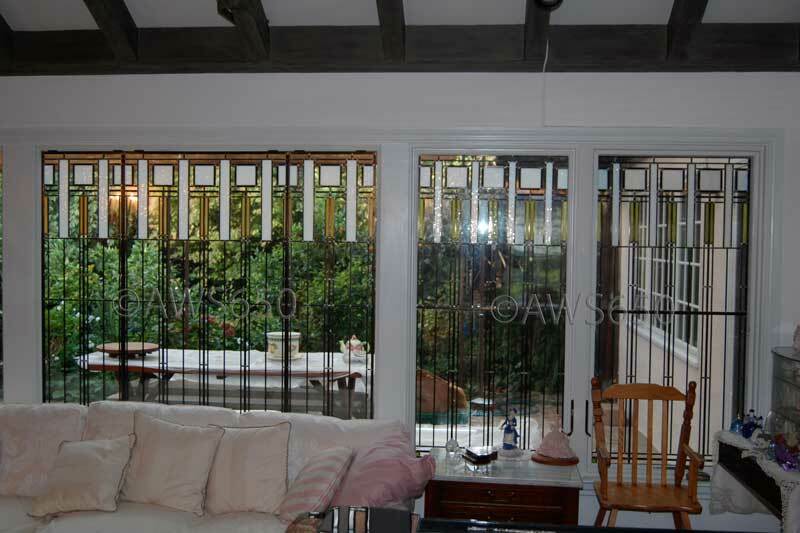 Andersen 12' Frenchwood Gliding Patio Door with removable grids. 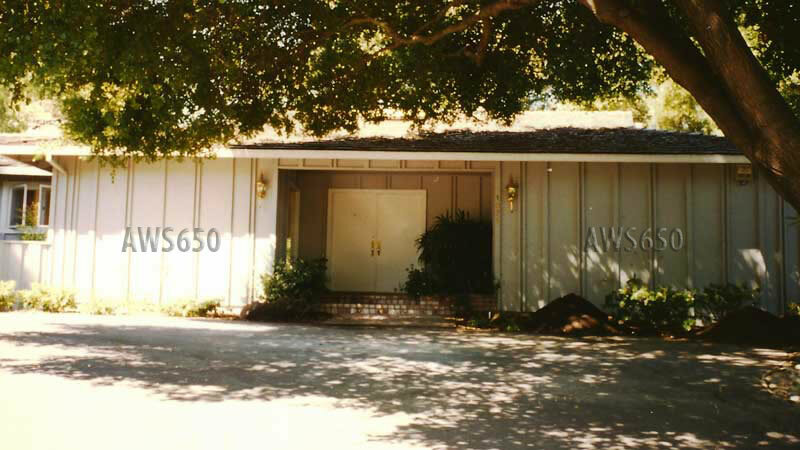 This photo was taken about 15 years after installation. 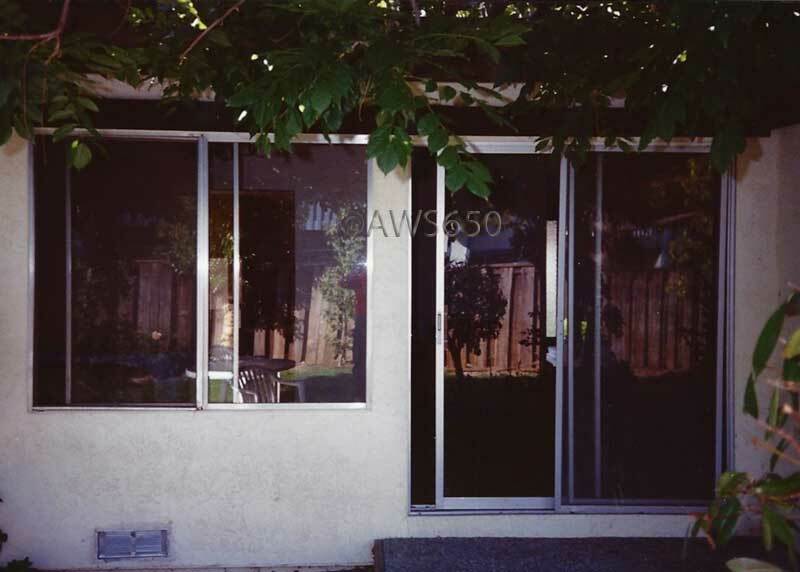 Before photo of original aluminum window and door. This installation required a new header. 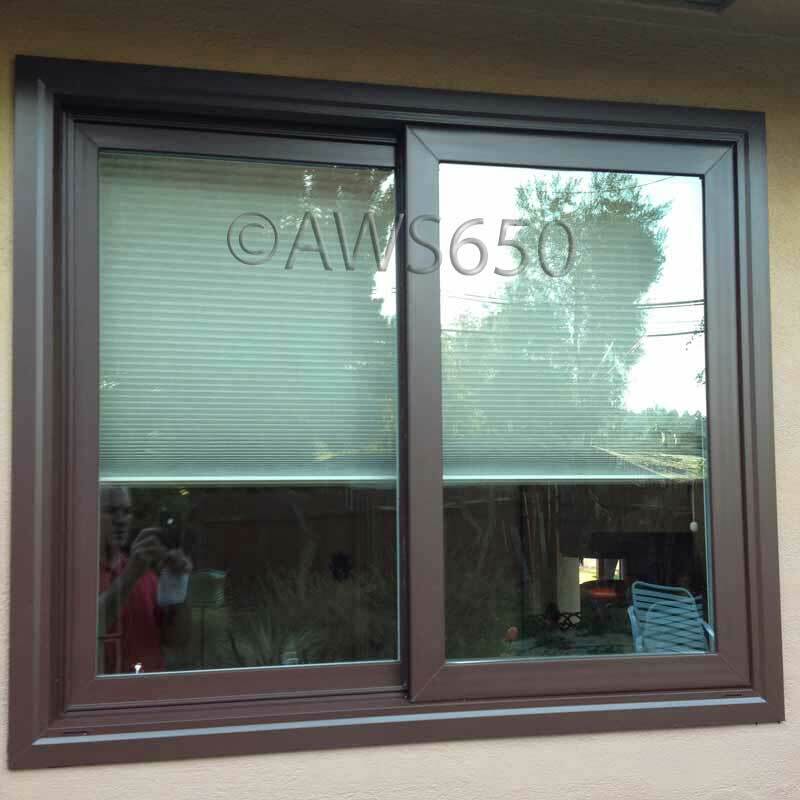 Andersen 400 series casement windows installed in wood siding. 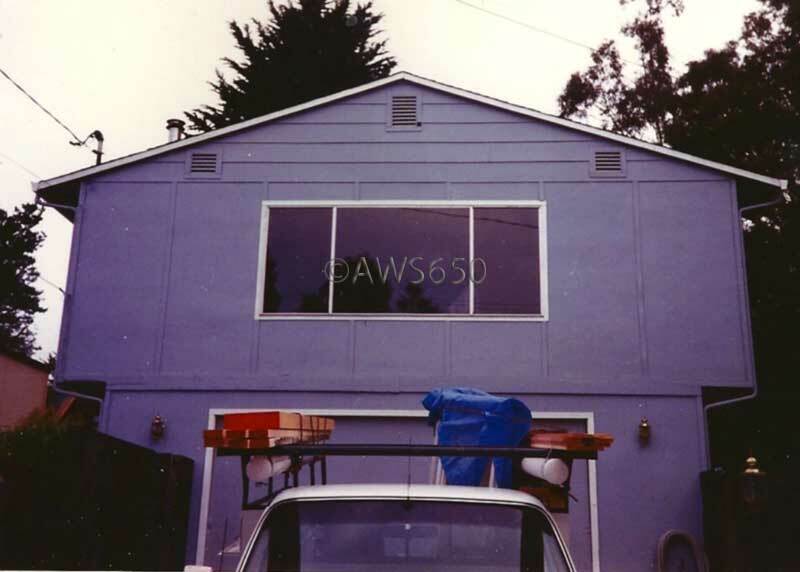 Before of original windows in wood siding. 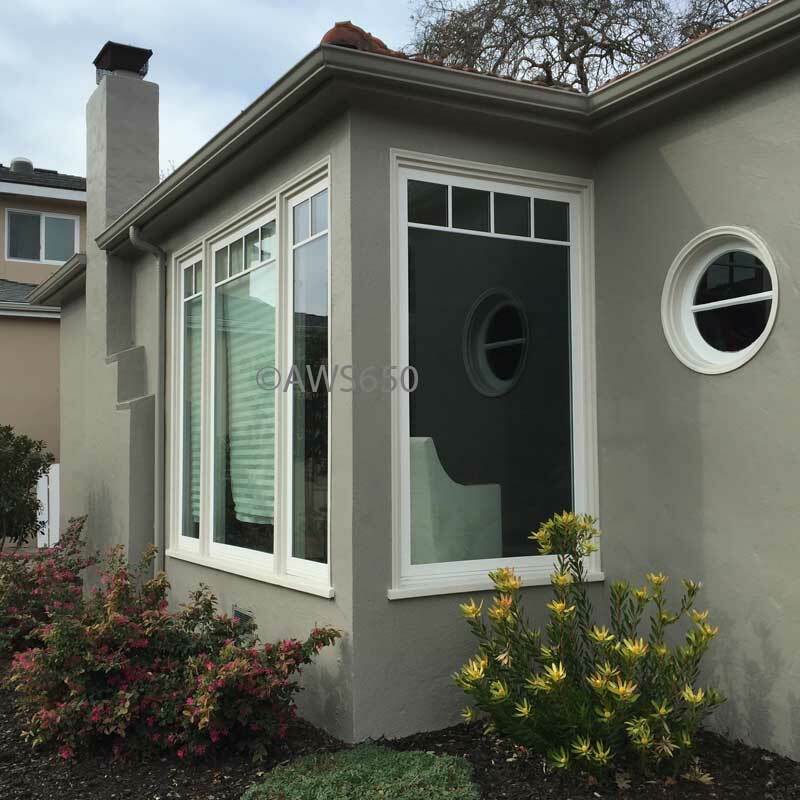 Arched Andersen 400 series flexiframe new construction replacement Windows Installed in Menlo Park, Ca. Before of blank walls. This installation required two new headers. One room was the living room and the other the dining. 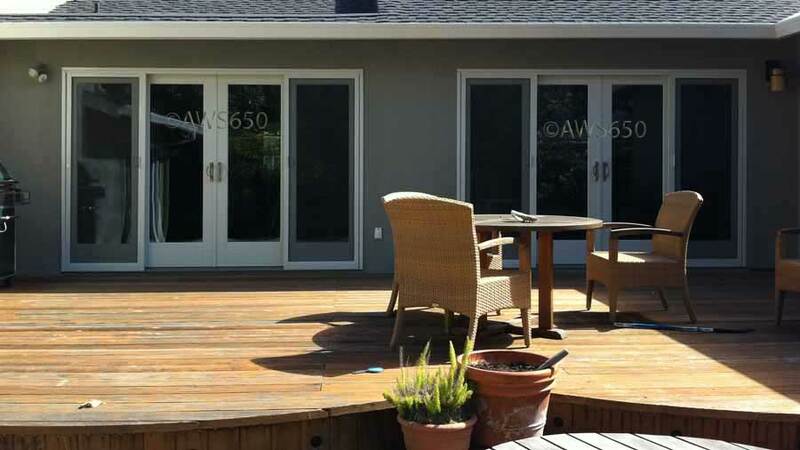 Andersen stain grade wood installation in Redwood City. The interior paneling was carefully removed and re-installed to accommodate the new header. Before photo of the original steel window. 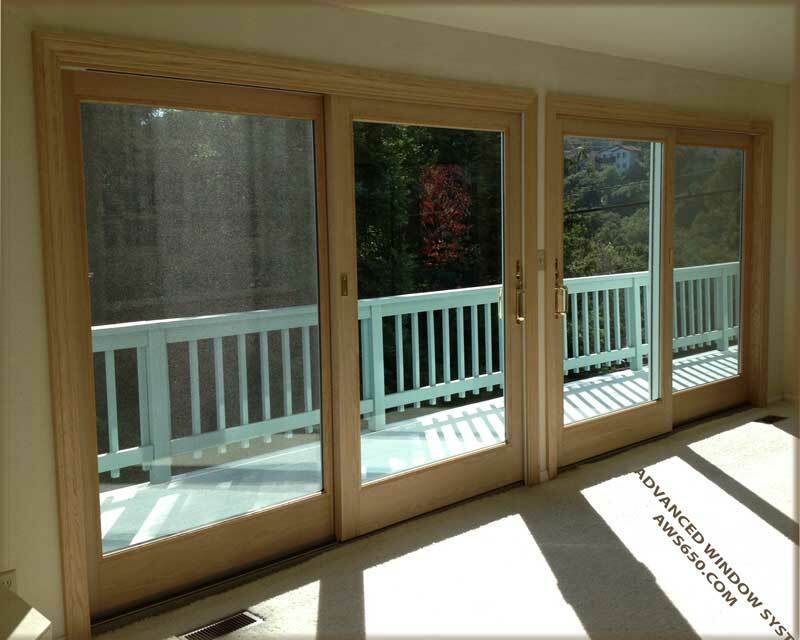 Stain Grade Andersen 400 series Frenchwood Gliding door with removable grills installed in Redwood City. 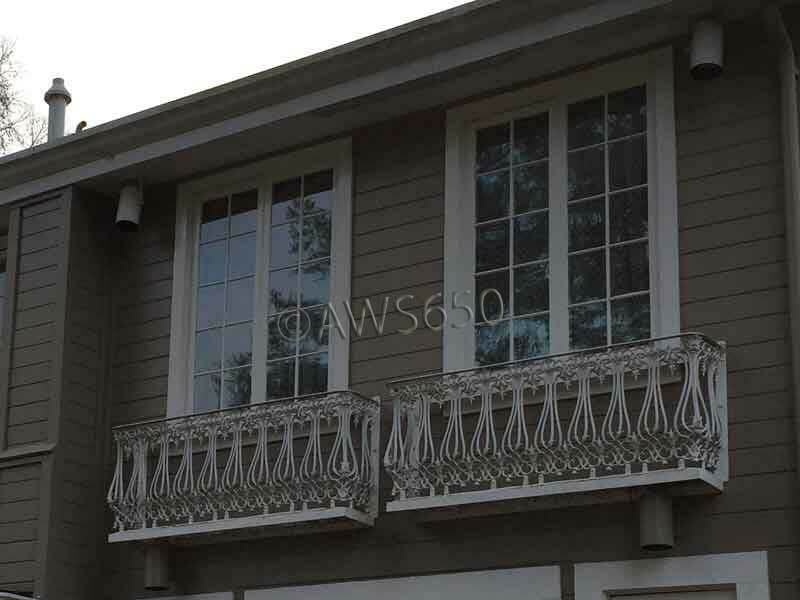 Background Photo of prefinished white exterior. Trim not painted yet. 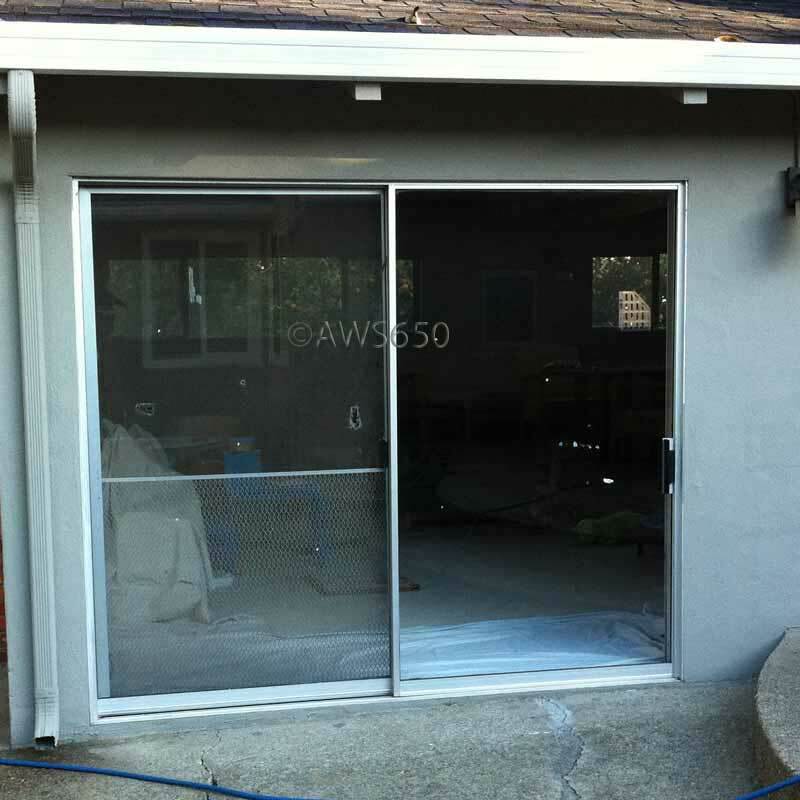 Before photo of interior and exterior of aluminum patio door. 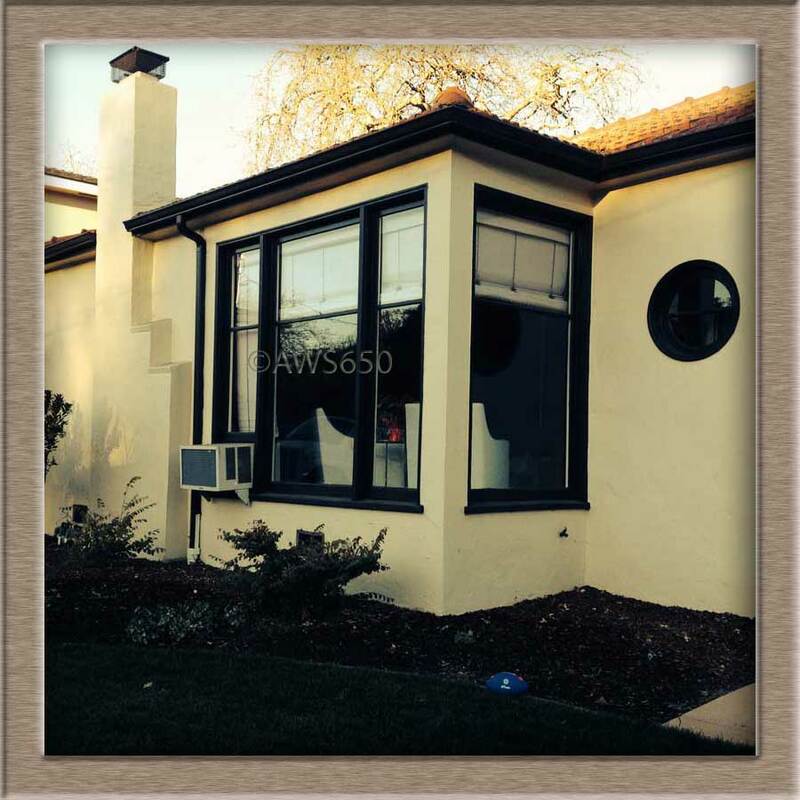 Vinyl Windows with out grids installed and new exterior stucco. 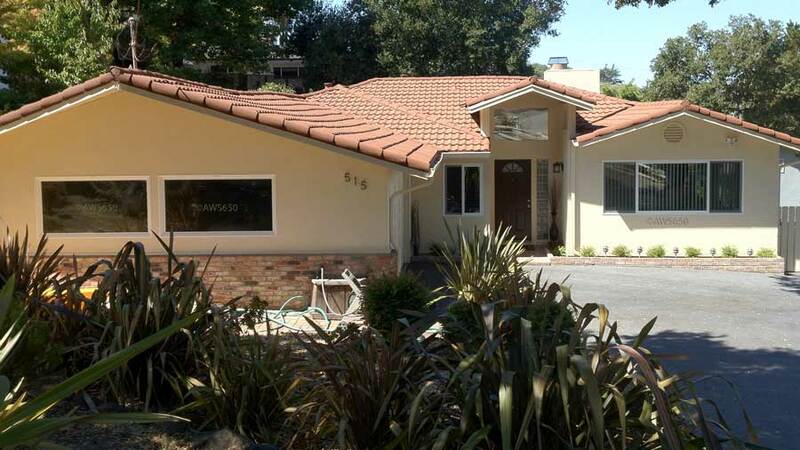 This installations in Belmont and the stucco was done by a Stucco specialty contractor. 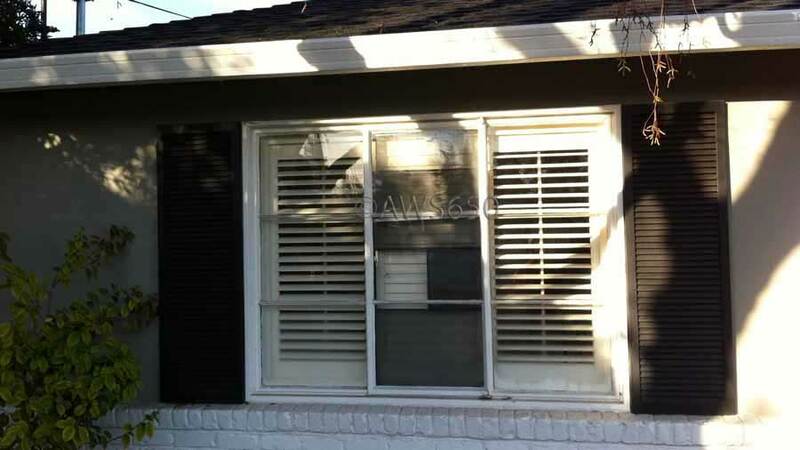 Before photo of old out dated wood siding and aluminum windows with grids. Same photos as above before photo is behind. 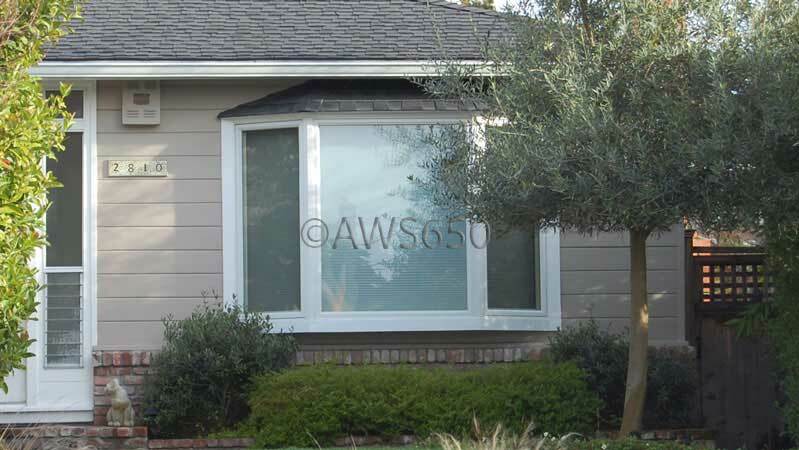 Milgard Tuscany Vinyl replacement Picture windows with Valance S.D.L. 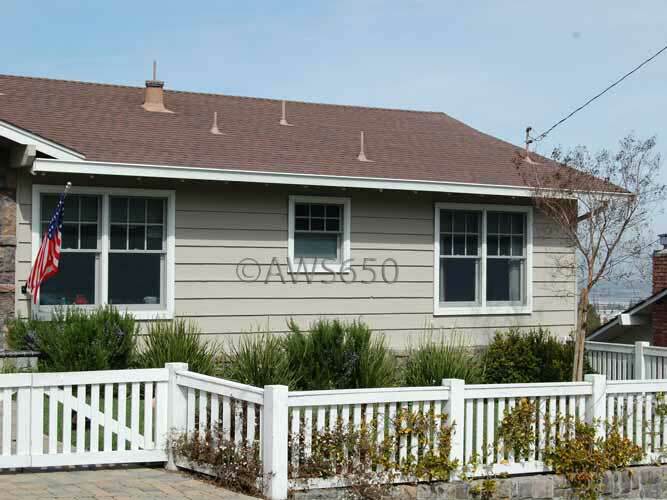 grid installed in a older home in San Carlos. All the interior trim was replaced by us. Before photo of old rotten wood sash with air conditioner hacked in. 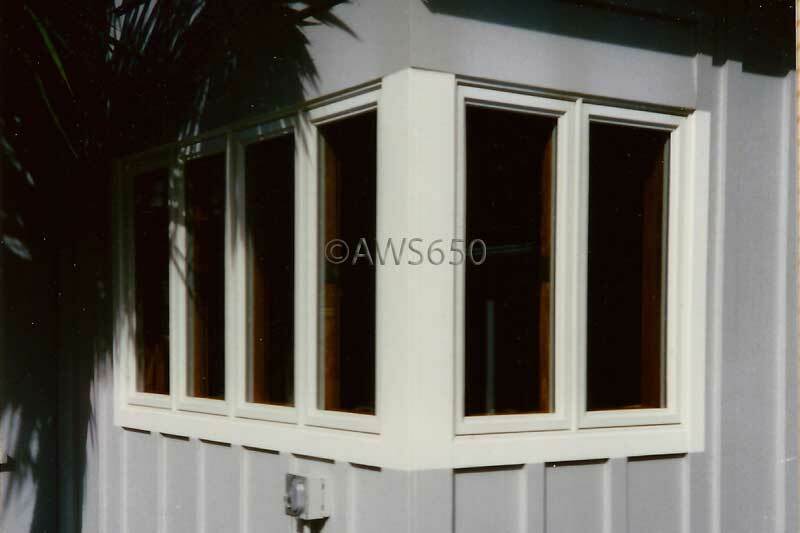 Original wood picture windows with hacked in air conditioner. 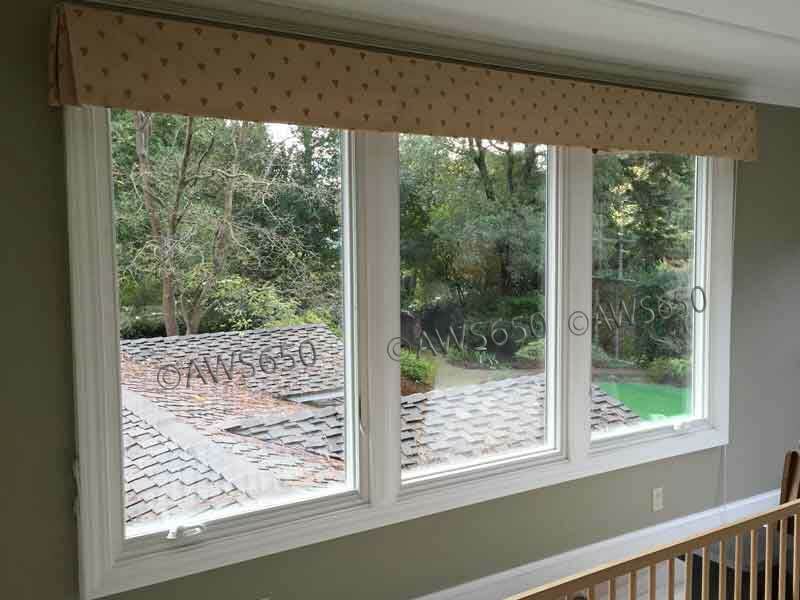 Stain grade trim was milled on the job by us with our portable planner. 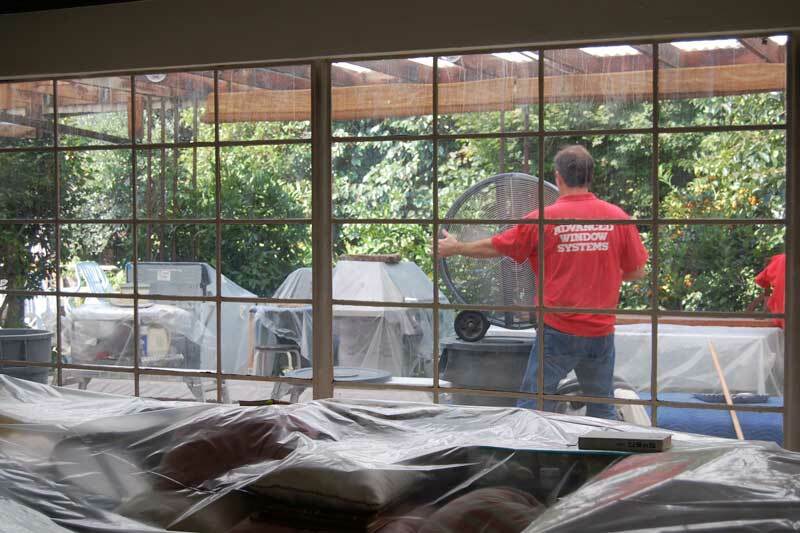 These wood windows tilt in for cleaning and have high end Low-e Glass. 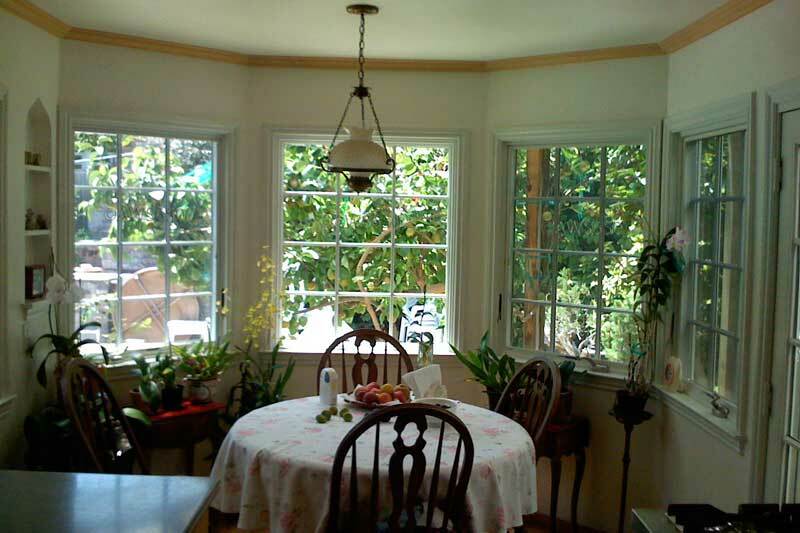 Before photo of single pane wood double hung windows original to the house. These windows were drafty and were very difficult to open. 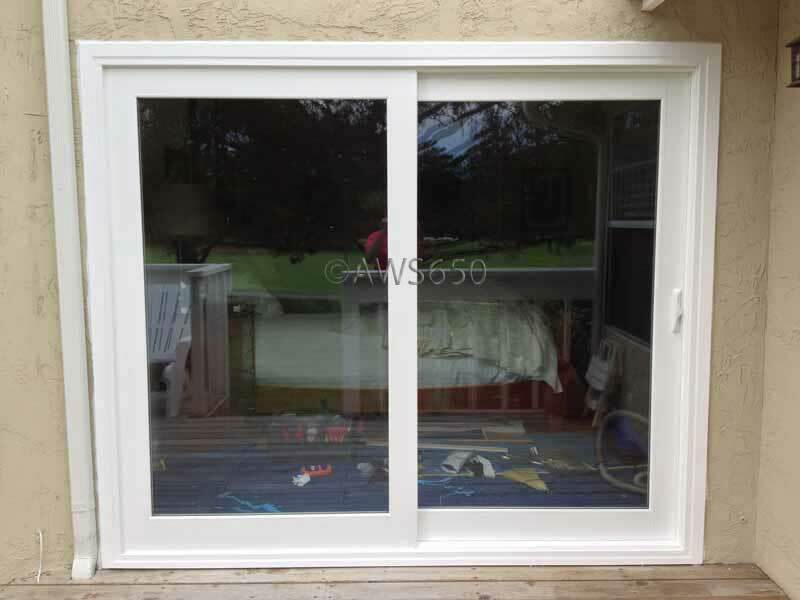 Andersen's Sandtone 400 series Frenchwood gliding patio door next to Milgard's tan Ultra Fiberglass window. These two products look very well next to each other. Background photo of interior. 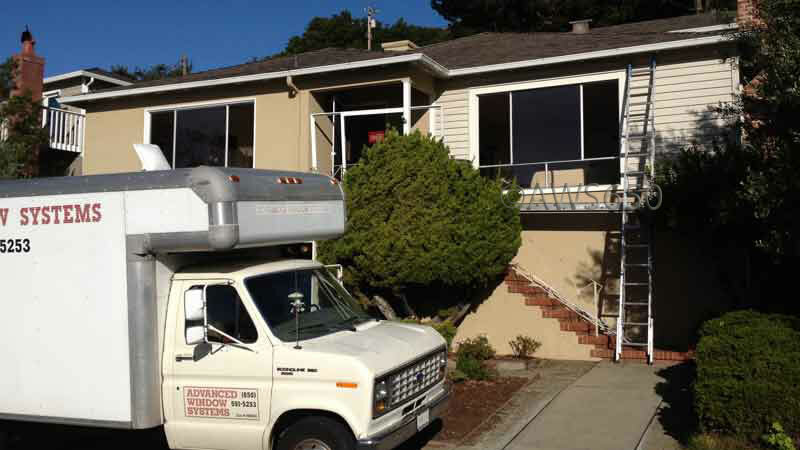 Installation in San Mateo,Ca. 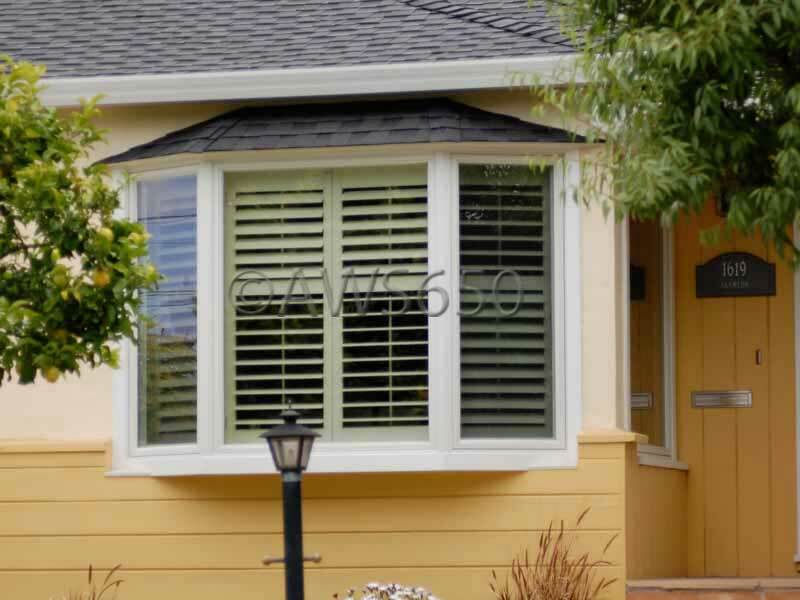 Milgard tan Fiberglass ultra window. This window is white on the inside. Before Photo of original aluminum windows. 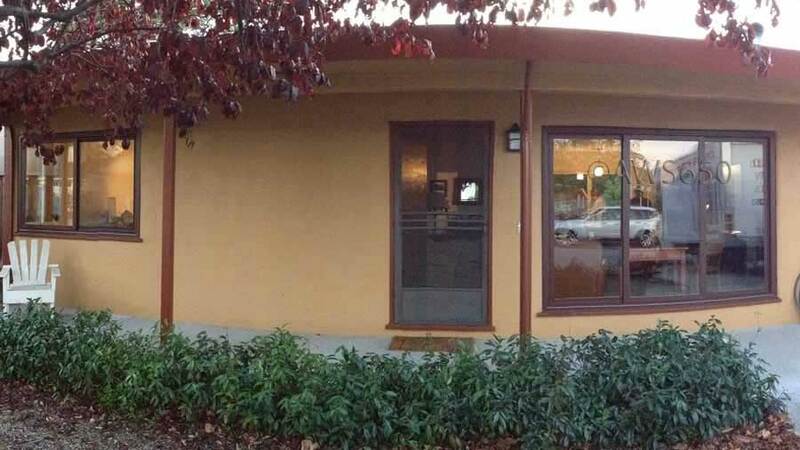 Milgard Fiberglass Replacement window with tan exterior. Background photo of white interior.